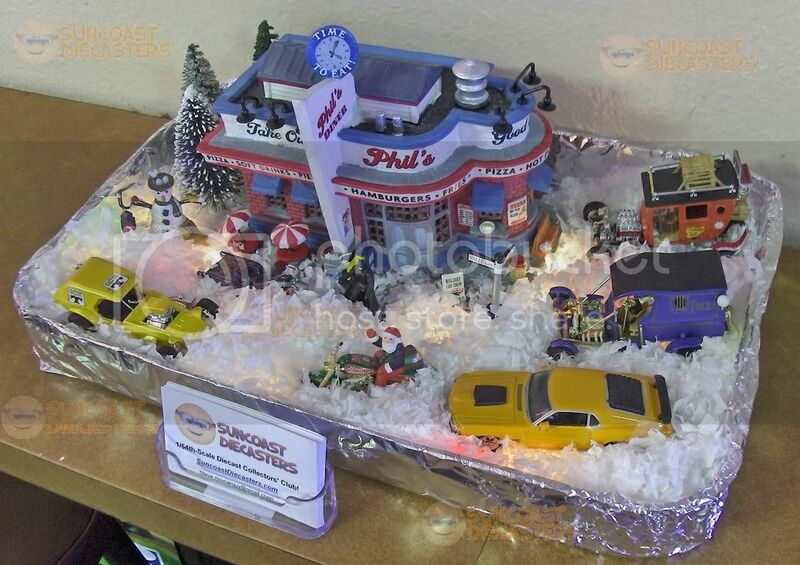 Mike C. sent me a photo of his Christmas diorama at home. 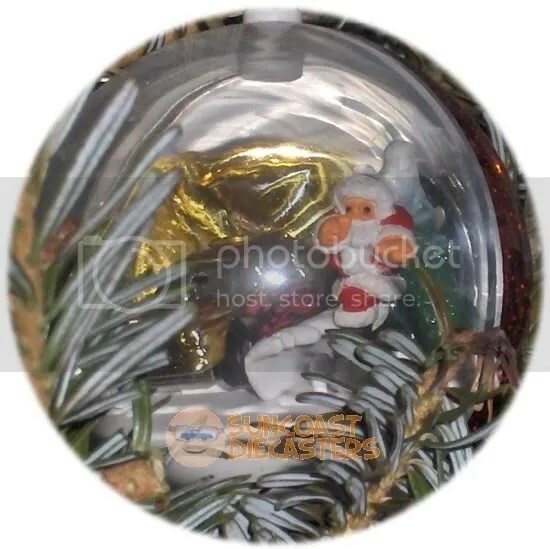 Not only thoughtful but convenient as well, as it allows me to bookend this month’s Gallery update with holiday festiveness. Christmas RAOK from Bill. 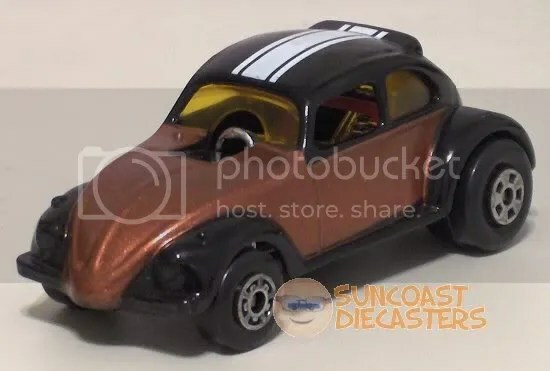 This is the ’81 re-color of the ’31 Doozie, which will go nicely with my fancy American Classics version and my original from ’77. 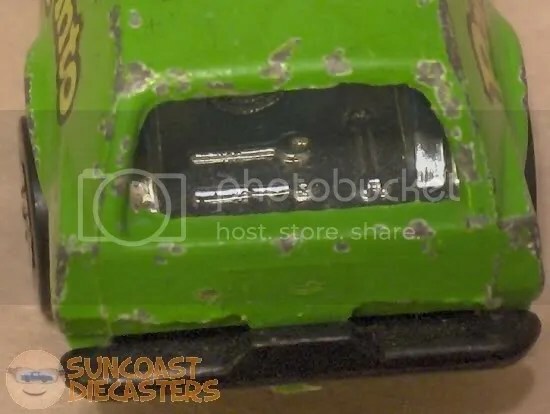 Jim brought in a collection of wonderful rare models, including this great green Gremlin Grinder. …And to whom does this lovely red interior belong? 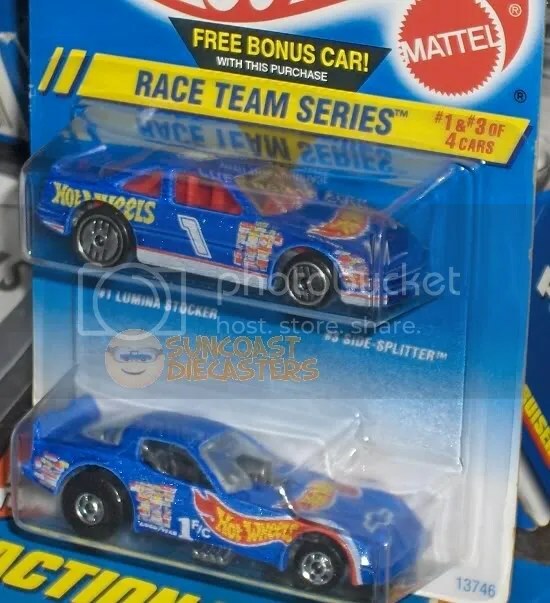 Well, it belongs to the Lumina Stocker in this “bonus car” Race Team package. 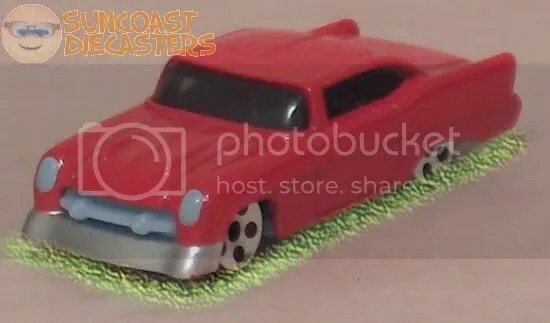 By the way, this “red interior” version is extremely rare. How rare? ; let’s put it this way: book value on this set is between $100.00 and $200.00. Jim prefers cash, thank you. Big Tractor Mike brought in a bunch of large-scale models, mostly Tonka but a few other brands as well. (Maybe they’re better described as large-size rather than large-scale.) 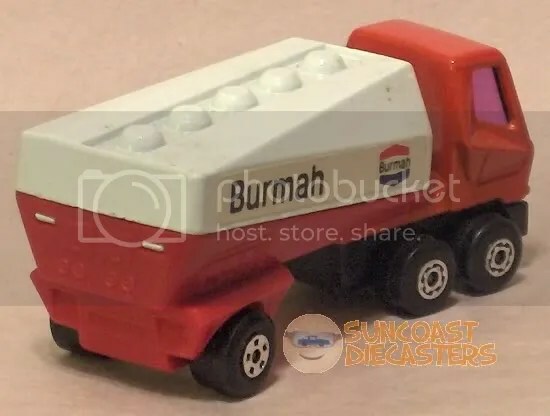 Pretty evenly split among trucks, military vehicles and construction vehicles — however, there was one oddball in the bunch: this Vega Major Luxory Coach, by Dinky. Seems to be about 1/43 scale (I guess, I suppose). A few dings and scratches, but otherwise in very nice shape. I don’t why it caught my attention, but it did, so after some hemming and hawing I relieved BTM of this bus burden. 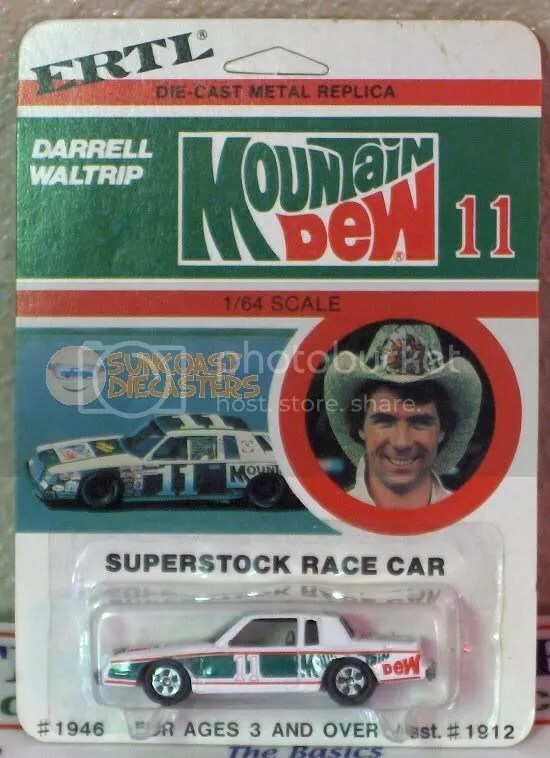 A guest, Bob K., brought in a fine collection of rareties, not the least of which is this more rare than rare Hardee’s collectible. 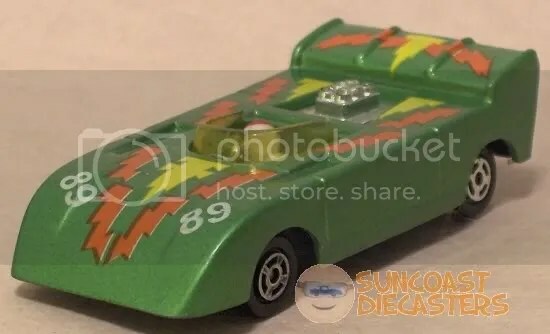 This is the “Road Runner” race team set from the mid- to late-70s (Ertl-made, by the way). 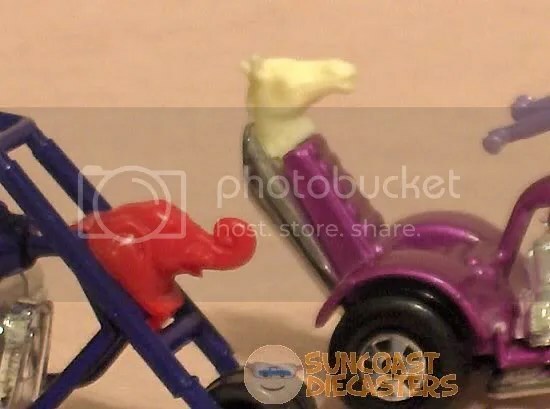 Brief web research reveals that Road Runner was actually the driver character in the commercials who, with Eddie his mechanic, would stop at Hardee’s after every race. 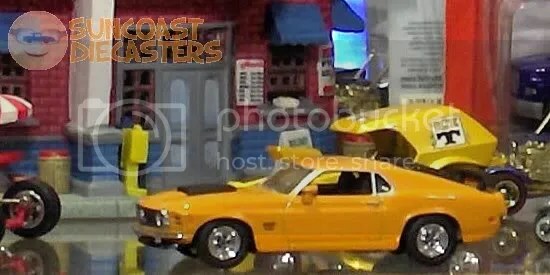 Note that the set has three pieces: car, truck and trailer. Brief auction site research reveals that the car or the truck can be found separately, but none even seem to be aware of the trailer! A word to the wise collector is sufficient. 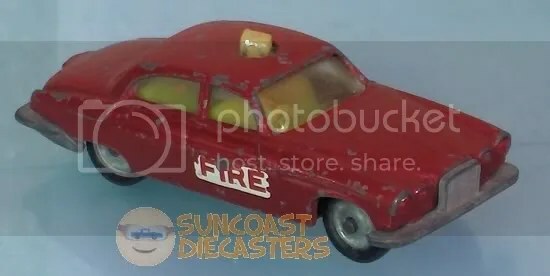 Ken scored this ritzy red Fire Chief from Bob as well. 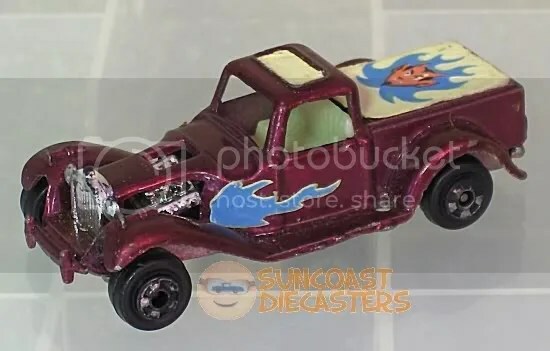 Again from Bob, Ken also nabbed this super way-cool hot-rodded Ford pick’em-up truck by Zylmex. Ken did quite well with these four well-presented Wellys. Ken scores again with this JL Custom AMX and sweeet Edelbrockified Bel-Air. Ken again! Man, that Willys jeep is too, too cool. One man’s trash is another Ken’s treasure. 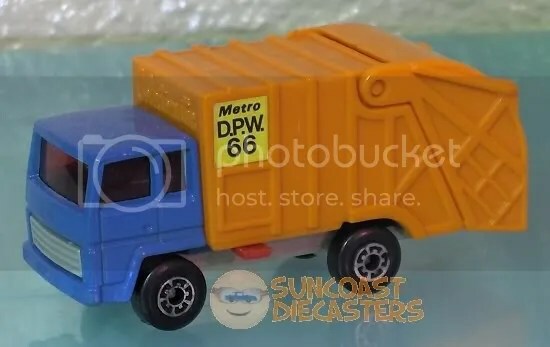 Ken ups the value of his already-valuable garbage truck collection with this handsome hauler. It wouldn’t be Christmas without cardboard! Ken & his daughter make these groovy decorations from cardboard backers. They’ll do requests for a specific brand or line if’n you give them twenty (20) of the specific backers you prefer. As you can see, this’n’s made completely out of HW Mystery stuff. “Christmas Village” snowman fill out the scene nicely. Battery-powered lights provide festive “under-snow” lighting. Hey, you want some groovy (post-)holiday wallpaper for you computer? ; then click on either of the images below and download nice large copies for free! Mike C. scored this custom from Rob. 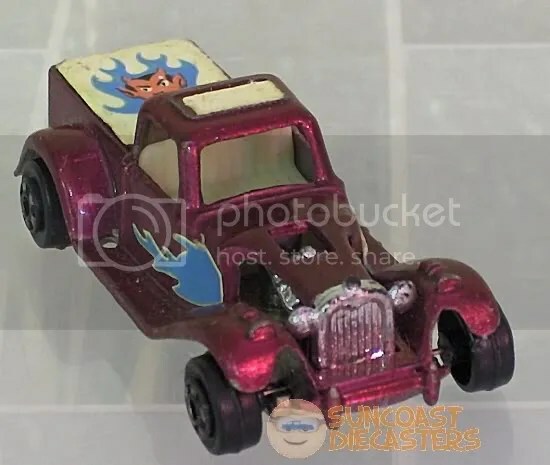 Rockin’ some serious ghost flames, there, Robster! 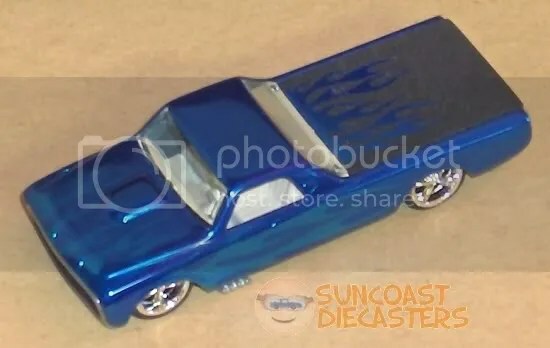 Always something new at Suncoast Diecasters meetings. 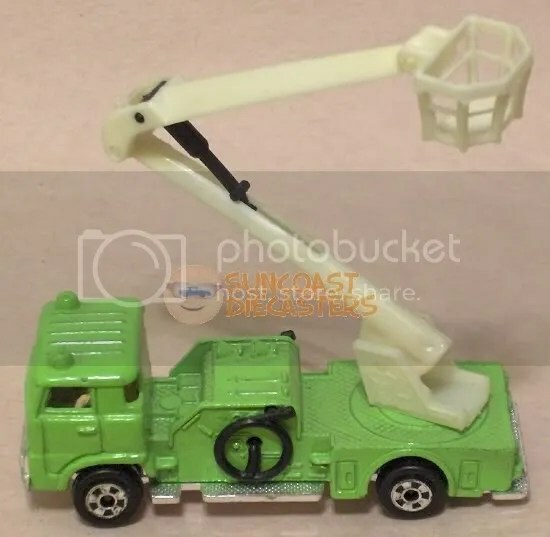 Here, Big Tractor Mike brings a sweeet collection of trucks and construction / service vehicles. Shelby 427, courtesy Jeremy. (I should’ve taken in out of the Kar Keeper. Oh well…) I didn’t notice until after I took the picture that instead of the original Otto illustration, they used the actual Custom Otto model. 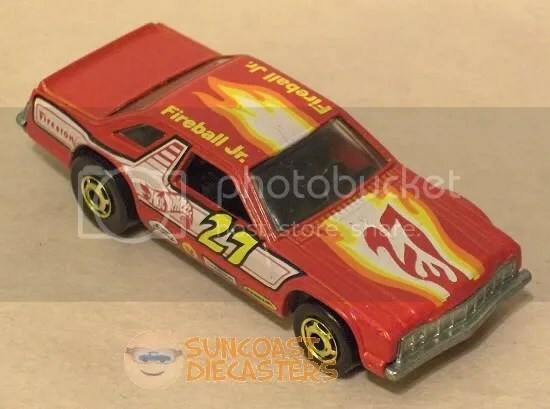 Cool: the old-school flames and Mattel logo, combined with the 40th Anniversary icon. 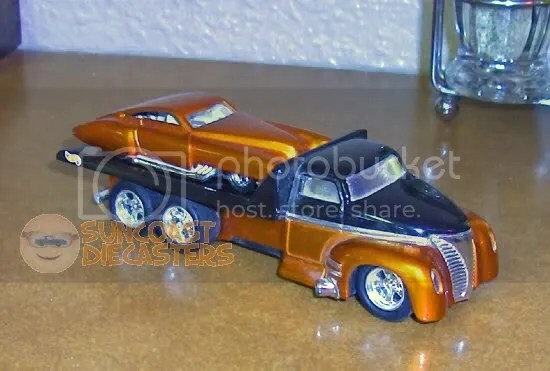 Ken scored this gorgeous version of the Custom ’53 Chevy. You know, that Custom ’53 Chevy: the one with the seethroughable hood. RAOK, courtesy Big Tractor Mike. I don’t recall how the discussion went back in September, but when I arrived at the November meeting, this wonderful thing was sittin’ on my table. 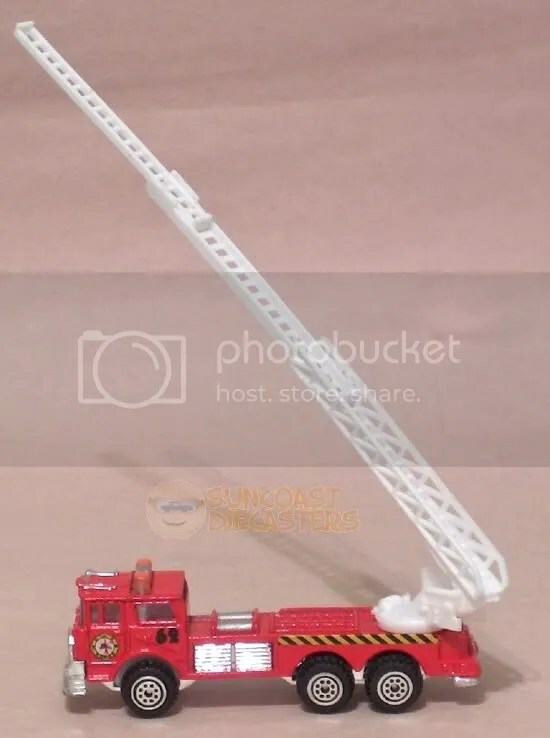 This is the Plasticville Turnpike, an O-gauge model railroad accessory. 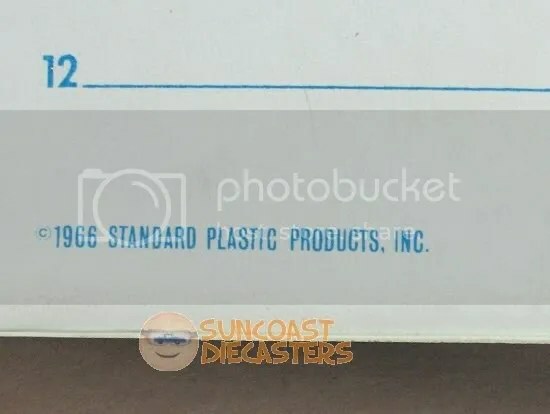 In case it looks familiar (aside from whatever model railroading experience you may have), it’s because BTM used this model to stage his Cooper-Jarrets; you can see the pics if you scroll way, way, waaay back to the July ’07 photos. 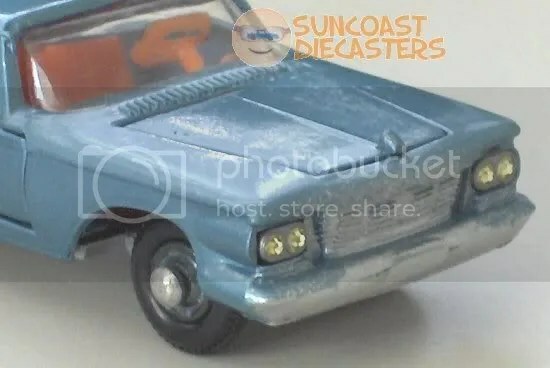 I get a kick out of this model because, as a native Floridian, “turnpike” is a natural part of my vocabulary. I’m so pleased with the way this photo came out, that I’m offering an additional bonus: clicking on this pic will bring up its own large version [1900 x 857 x 16M]. 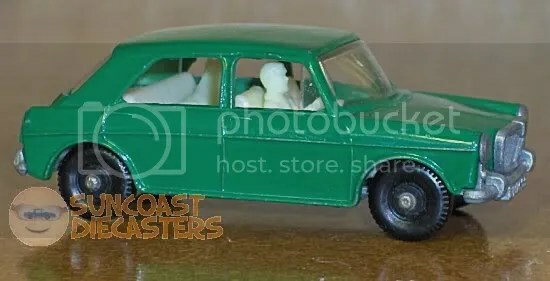 Upon learning that the turnpike model is O-gauge, which is 1:48 scale, it was a no-brainer that I should stage it with some of my 1:43 cars. But, I decided to kick it up a bit: a photo of an actual highway as a backdrop. That is, you could “look through” the turnpike to see the roadway beyond. I found a photo online that worked, and the result is quite satisfying … however, I haven’t yet heard back from the owner of the photo as to whether I have permission to use it here on the site. 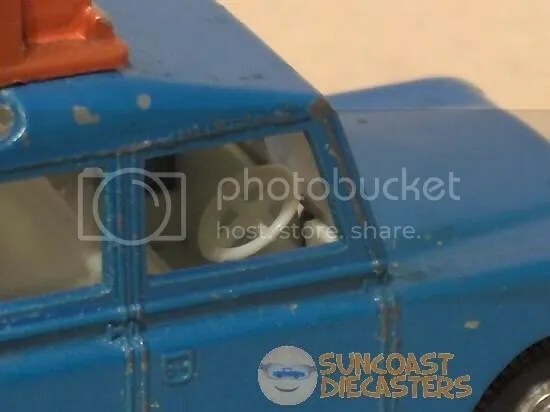 So, in the meantime, let me tease you with the substitute version below which, in place of the highway photo, features a groovy, funkified background! Towards the end of the September meeting, some guests popped in with a collection of oldies, all of which were in great shape. I already have a Front Runnin’ Fairmont, but mine is really, really, really beat up. So, I was more than happy to aquire this beauty. Land Rover Safari, ca. 1967. Those of you with a keen eye will note that it’s been customized with painted details. Big Tractor Mike advised me that such customizing knocks down the value for hard-core collectors. 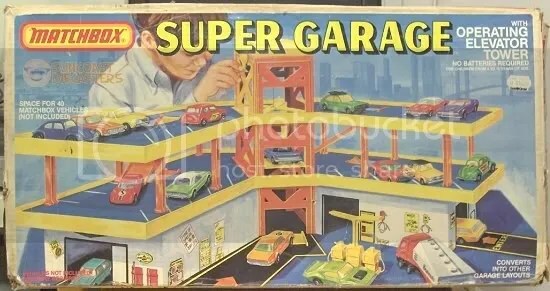 However, I am not one, and considering both that the toy is in very good condition and that the painting was done very neatly, I found his asking price to be very reasonable. Clearly meant for Jolly Old England with that jolly old right-side steering. Note the fine body details. You might also note that the door seams are embossed rather than debossed; a simpler method, but with less realistic results in the miniature. 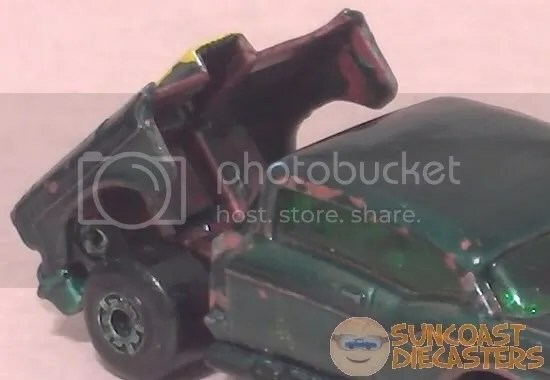 And here we have Skids and Mudflap from the new Transformers movie. I’m KIDDING! That’s the ’68 Toyota Land Cruiser on the left, currently on the pegs. Here’s where it all got started. 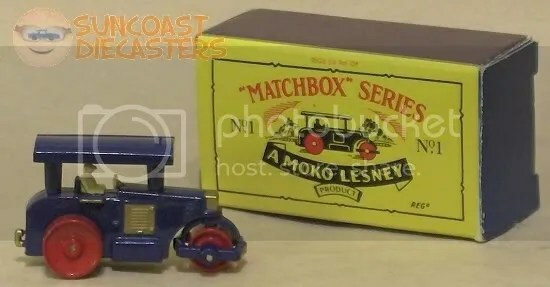 The very first miniature vehicle sold under the Matchbox name. Of course, this isn’t an actual original No. 1 (I ain’t gots that kind of money!). It’s from their very popular reproduction series. Courtesy Big Tractor Mike. Turns out it’s a Superfast-era version of the car on the left: the Lotus Europa! This is amazing — owning two separate editions, by the same manufacturer, of the same car. The models, separated by several decades; the designs, by only a few years. Ah, again, made in jolly ol’ England, not some, shall we say, more far off, exotic land. Note also the “transitional” wheels. I generally don’t collect European sportsters; however, this one, also from BTM’s sale, is in fine shape considering its age, and the doors work, so … okay, now I’m collecting European sportsters. And in grabbing this one, I also, quite inadvertantly, managed to accomplish something else — which I’ll explain later(!). Steve, a guest at our July meeting, brought some fantastic rarities, including quite a variety of Zowies (some even in their original baggies!). 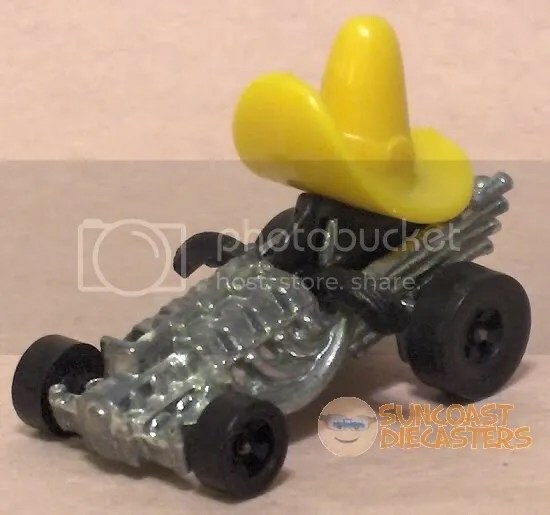 I couldn’t remembar all the ones I already had (c’mon, you’ve been there), so I picked one that I definitely didn’t recognize: this quirky little sombrero model. As I was setting it up for the photo, I noticed two black objects sticking out the sides. I presumed they were exhaust pipes; however, upon closer inspection, I realized they are the moustache on a little face under the sombrero! 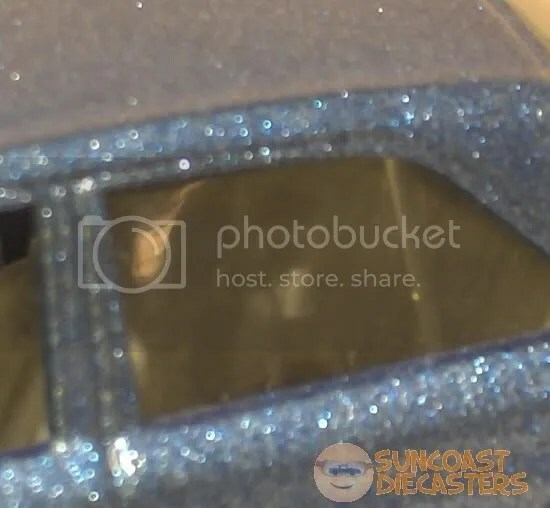 I guess his “eyes” are supposed to be windshields — which brings to mind the classic saying, The eyes are the windows to the passenger compartment. Or, something. For those who’ve never seen Zowies before: here are some. 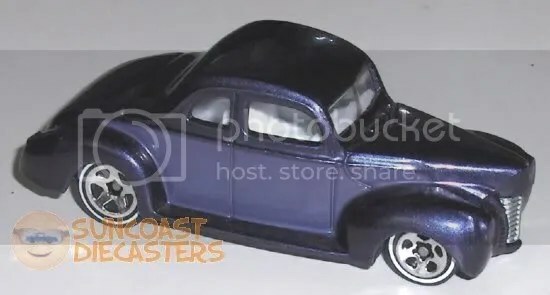 I also generally don’t collect old pick-up trucks, but this one’s a Yatming, and really nice. …The Maisto Fresh Metal model on the left. (By the way, there’s hardly any metal, fresh or otherwise, to be found on the Maisto.) 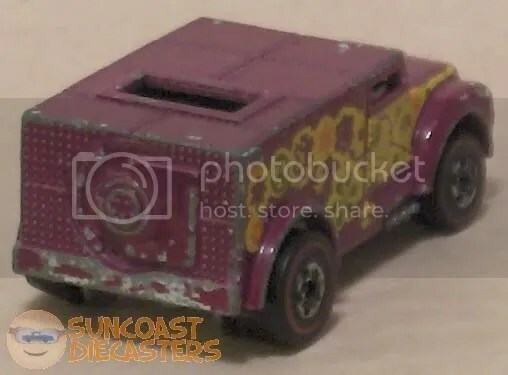 Naturally, I presumed the bargainvette to be a Summer, based on the low quality of the casting; however, the model number on the base indicates it’s a Yatming(!). Compare this to the Chevy p’up above — I’m guessing Summer made the ‘Vette for Yatming. So, I wondered, what can I learn of this Bedford CF which made this Summer Van Model? 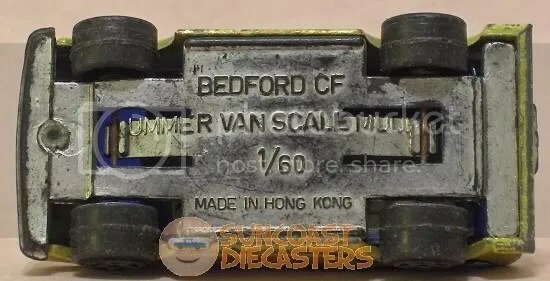 Well, I learned that Bedford CF is the van model, which means Summer is the manufacturer. Now, again, compare this Summer-branded van (which has lots of nice metal, by the way) with the bargainvette and ChevYat pick-up. I’d easily suspect some other company, with better production facilities, made the van for Summer. Yet, the question of what Summer can and cannot do gets even more intriguing with this model, the Lola T260. Considering everything that’s wrong on the model, it’s still for Summer a very adventurous design. Speaking of intrigue: I have many Summer models with no brand name — you can tell they’re Summer ’cause, you know, they look like a Summer model. I happen to have two (including the van above) which actually say Summer. But this Lola is the first one I’ve ever seen with the mythical leaping gazelle logo. Man, I’m just denyin’ everything this time! 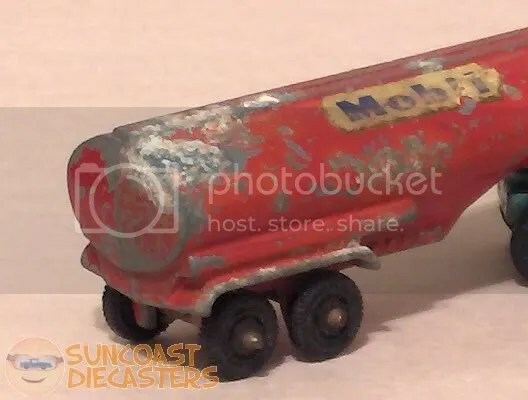 I (AHEM) also generally don’t collect tanker trucks. However, I was looking for this model for a particular reason. First, let me give a shout-out to Big Tractor Mike for having one in such great condition. 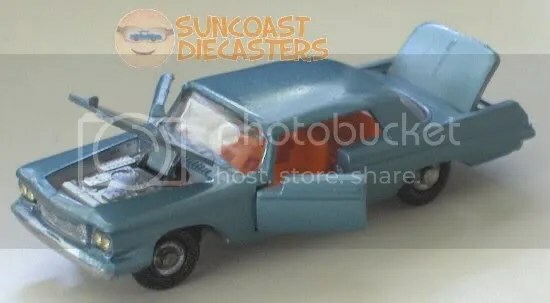 Look over the photos, then I’ll ‘splain my want for this model. …Except for this tanker. I can’t explain it, but this one got in my head and stayed there. So, when I found one in very poor condition, and BTM offered the lovely above instead, I very happily acquired it. While I was setting up the box for the above photo, something in the corner of my eye grabbed my attention: just to the side of the Burmah was a little orange sportser which looked oddly familiar… And now you know what it was that I mysteriously referred to several pictures above: I inadvertantly managed to collect not one but two of the models shown on the box. Or, make that three. Well, maybe two & a half. 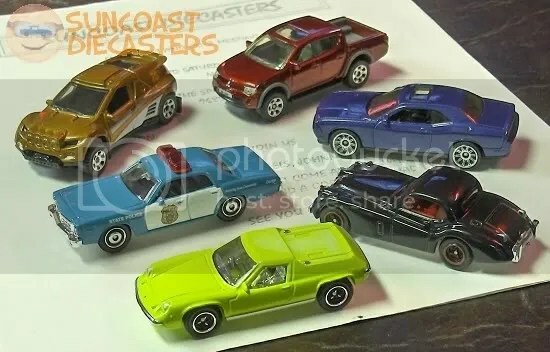 Different names, different colors, different castings, but still the same design(!). 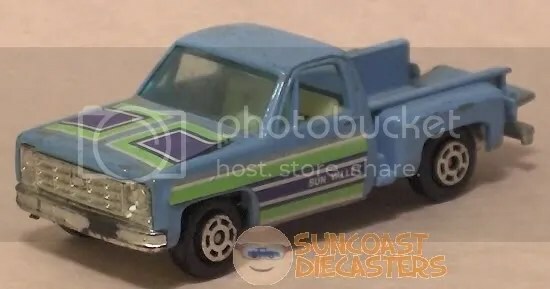 This is from Matchbox’s Rollamatics series. Each vehicle had an action feature operated by rolling the vehicle. 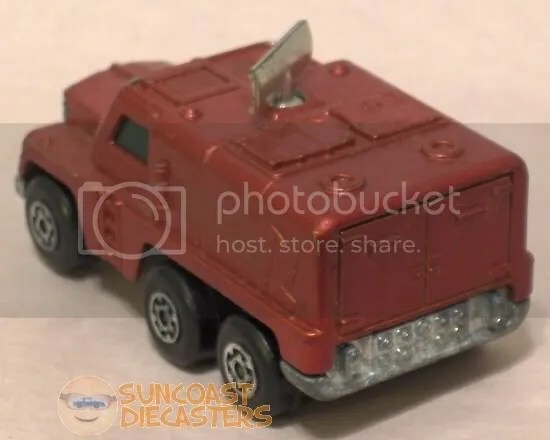 No guess as to the feature on this vehicle since, aside from the wheels themselves, the only other thing that could move is the radar dish. 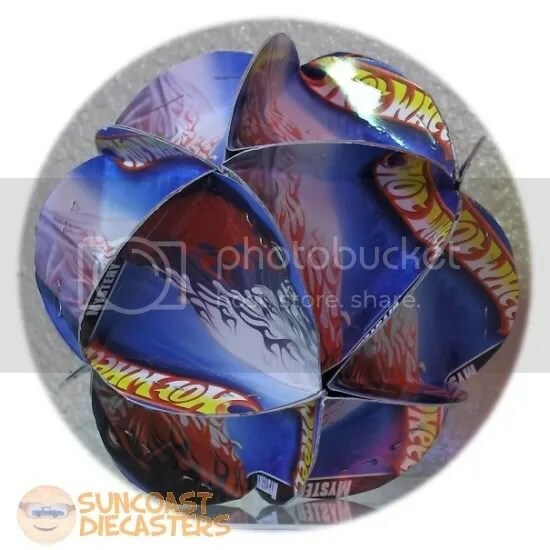 I’ve seen several of these over the years at Suncoast Diecasters meetings, and they all had a similar jerky movement of the radar. This tells me that either they all had the same failure in the action linkage, or that’s how the radar is supposed to move. Very nicely done base as well. Thanks again, Tomica! Note the mark, “S=1/54”; I’ve managed to collect a few models in the 1/50 range, so this’n won’t be all alone. Note also the Whizz Wheels-esque ridges on the tires. Ken had this rad-lookin’ truck sitting amongst his wares (his whats?). Oddly enough, I (mis-)took it for one of Rob’s customs. 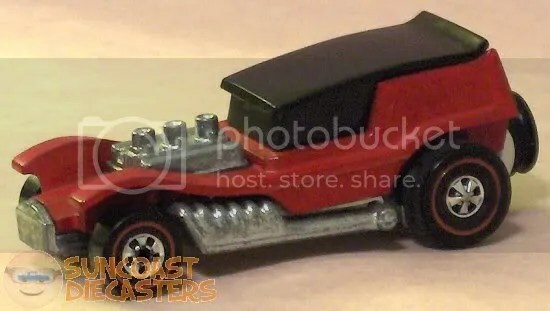 Ken informed me that it’s actually from Maisto’s “AllStars / Elite Transport” series. He bought it for the Willys, and decided he didn’t need the carrier. So, as friend, I relieved him of this burden. 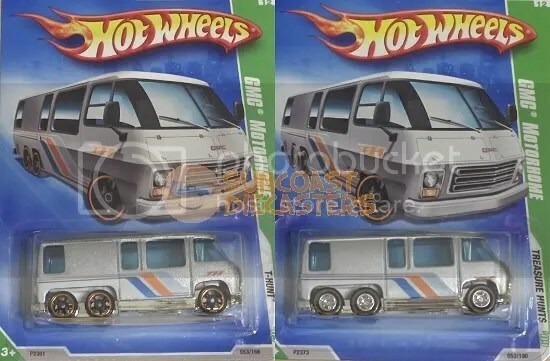 On the left is the Treasure Hunt series GMC Motohome I bought from Jeremy; on the right, the super-hunt version I found in the wild! 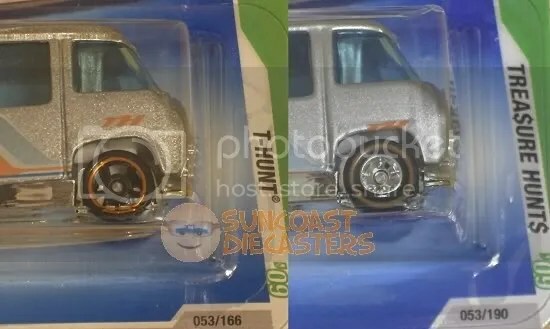 Yep, believe it or not, I found a super t-hunt all on my very own. Now, I suppose most of you can see, even in these photos, the differences between them, but, as a free service to you, close-ups are provided below. Note that in the illustration, the GMC is shown wearing FTEs, and the left close-up also has FTEs. 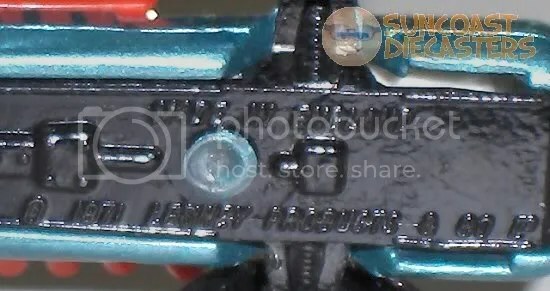 In the right close-up, however, the toy has Real Riders Note also that the left says “T-Hunt”, while the right says “Trea$ure Hunt$”. 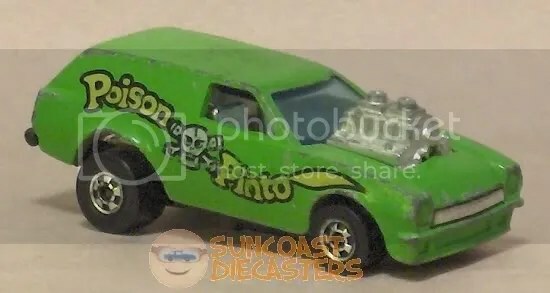 Oh, and the mis-aligned tampo on the super? ; well, that just makes it singularly unique! 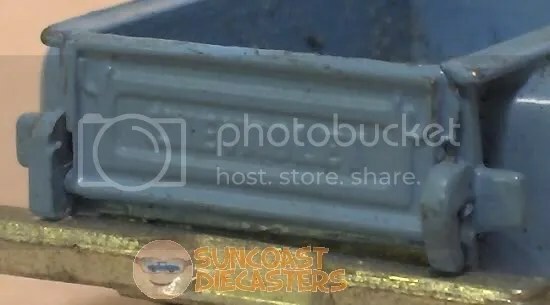 Again, this is why Suncoast Diecasters is seriously cool: BTM shows up with not just one, but several Zylmex still on cards! I determined this fire engine to be the coolest of the bunch. Note it’s not even punched, despite being price-tagged! Fortunately, Mike also had some Z’s loose in baggies, including a duplicate of the flamer. Dig the nicely-articulated boon, including “working” piston. Courtesy BTM, another Zee. Literally, ZEE, not Zylmex. 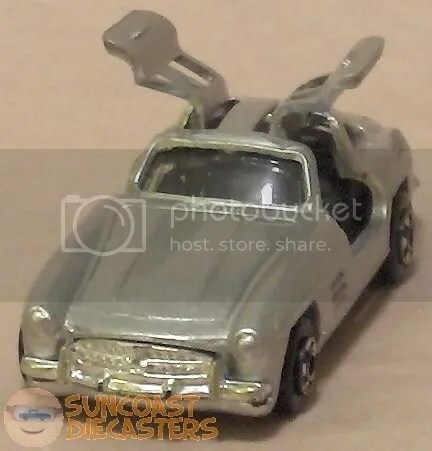 Merc/Benz 300SL. Pretty ritzy, no? …And how’s this for fancy-schmansy! Big shout-out to Ed, who managed to swing some time off and re-join us. Glad to see you again, Ed! 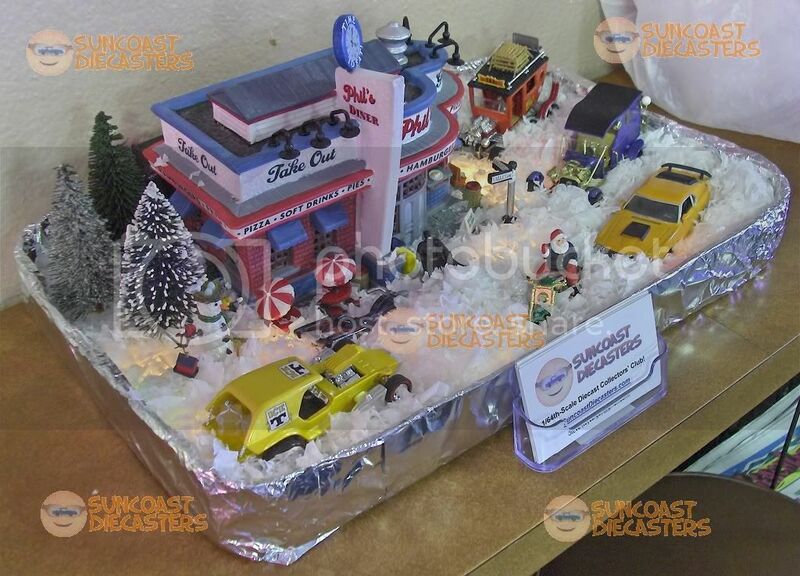 Of course, Ed brought a wonderful assortment of vehicles as well. I spotted this TootsieToy beach hopper and, not recalling if I already had this one (c’mon, you’ve been there), snapped it up. 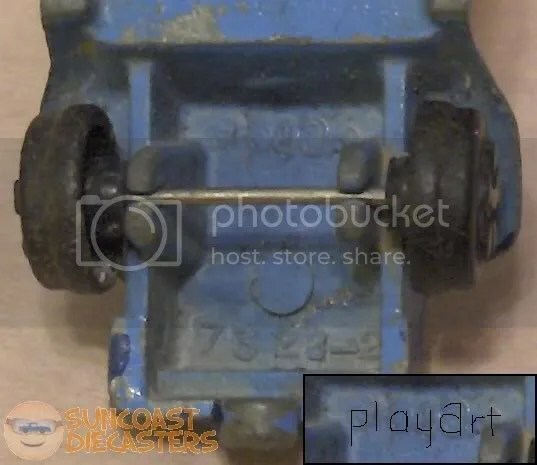 Imagine my surprise as I was looking it over to discover it’s not a TootsieToy; it’s a PlayArt! This is the best macro shot I could get; the only letter that really shows up clearly is the ‘a’ in Art, so I scribbled on the inset for ya. Ed also had a Flying Colors-era Land Lord. Don’t know if I still have my old original Land Lord, but if not, I got me a handy spare. 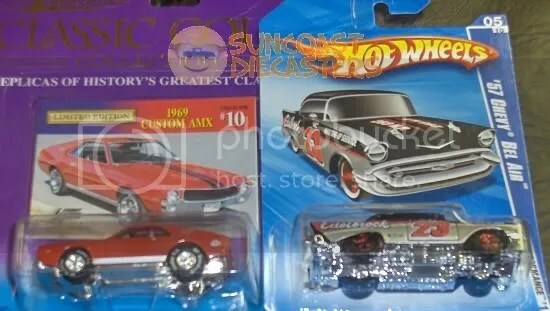 Never, ever would I have looked for or bought the Merc/Benz 380SEL. That is, until I learned that this one included a German Shepard in the back seat! 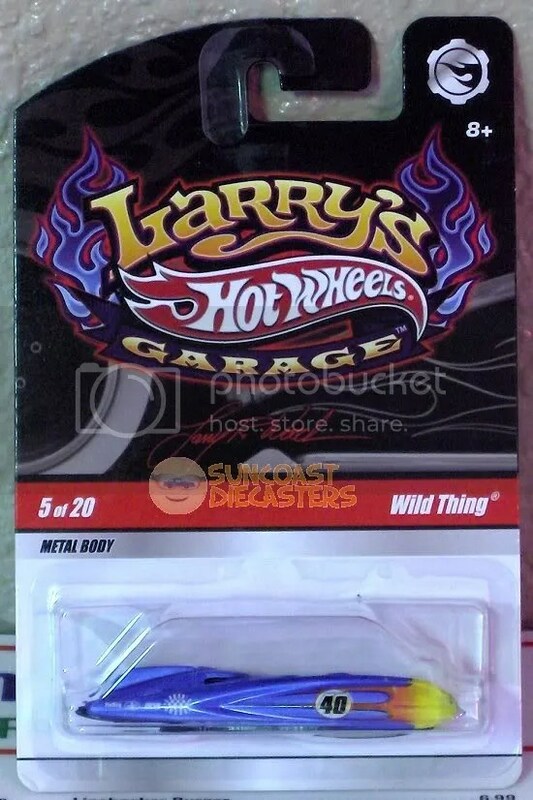 Now, finding old Matchbox cars with dogs is relatively easy; but a Hot Wheels car with a dog?! That’s unique! Best macro shot I could get (mebbe I shoulda backed out a bit); anyways, if you look at for a moment, you’ll see the four-legged anti-theft system staring back at you. 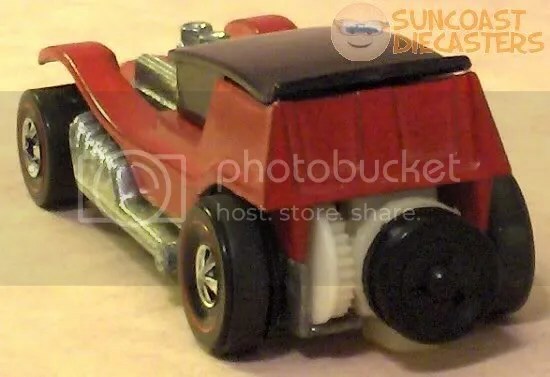 Another classic from the Edsortment – proof that oversized engines and rear tires can turn any car into a hot rod. Handy tool kit inlcuded, for when that rear-mounted fuel tank burts into flames. Yep, thar ’tis! The same black whatsit sticking up through the hood and everything! …Which, I’ve just realized, means I’m using the Super Garage box as an incredibly bulky and inconvenient catalog. Hmm. What the heck. The doors still work, the interior looks good, the car looks good overall for its age. 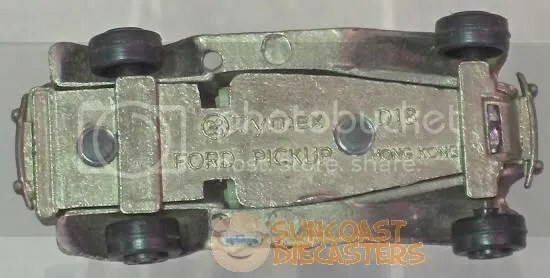 In fact, the only real problem is the missing trailer hitch which, really, I don’t care about. I mean, it’s not like I ever actually buy a trailer or anything. Rather nicely detailed turbine. 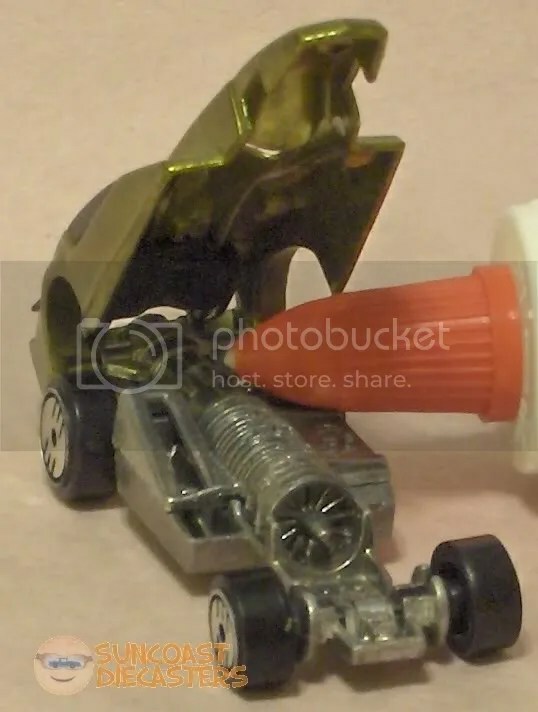 The Elmer’s glue bottle serves as a support because the body shell doesn’t stay up on its own. And here, to my shame, is the reason I sold it in the first place: the driver’s cage. Instead of being actually cage-like, it’s not much more than a box around the seat. And that’s why I sold it. Pretty stupid, no? Yes. Yes, it really is. It’s an original Redline-era Funny Money. I’m embarrased to say how little Ed asked for this rarity. I am exceptionally happy to have added this’n to my collection. Okay, okay, it’s missing some parts. I say, so what? I have an original Redline-era Funny Money! Woo-hoooo!!! 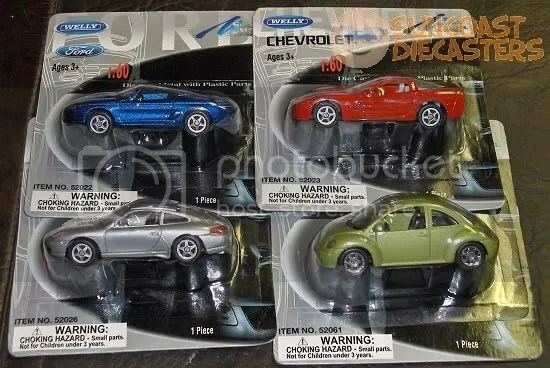 Ken had a sale, so I grabbed a bunch of cars for parts, for that day when I might actually start making some customs. As he was setting out his wares, I spotted this fire engine among them. I looked it over and was quite surprised at its quality. It’s a no-namer, no mark on the bottom except “Made in China”; yet it’s nicely detailed & painted. 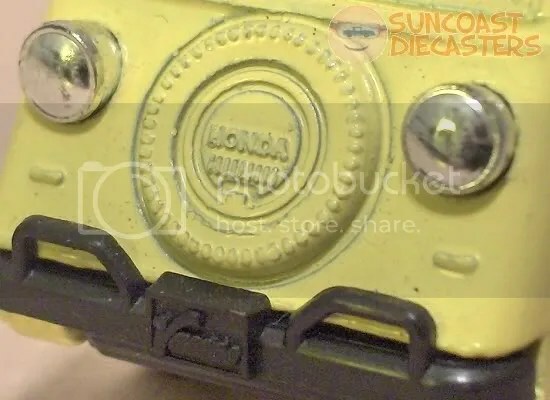 The “badge” tampo on the doors even has fine lettering that’s legible under an eye loupe. Can you believe this? 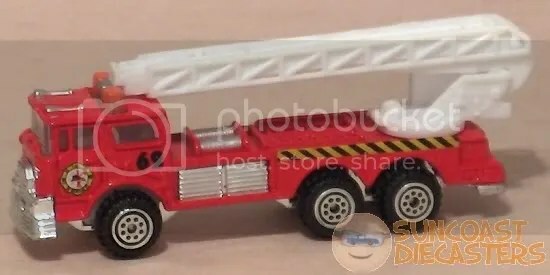 It even has a working three-section ladder! When’s the last time you that on a brand-name 1/64 flame-douser? Yup: it’s actually made in England. 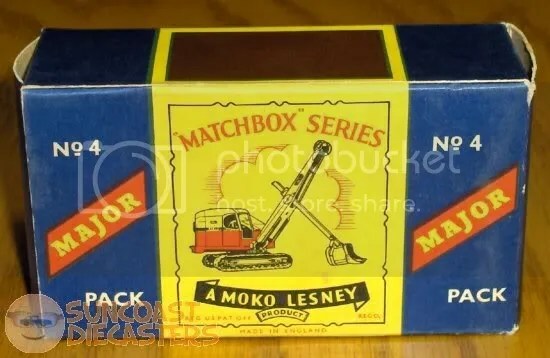 As recently as 1979, Matchbox was still makin’ ’em at home, as it were. In other words, the work wasn’t outsourced to Hong Kong, or Malaysia, or Tawain, or…. From the rare Zowies series. Surprisingly (and disappointingly), I haven’t been able to find much information online regarding Zowies (although I’ve found many photos). 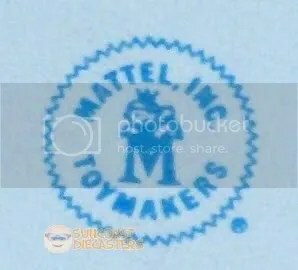 As I understand it from Big Tractor Mike, Mattel sold the Zowies line in the ’70s as a subset of Hot Wheels. The models all are comical in nature, with cartoonishly exaggerted features. 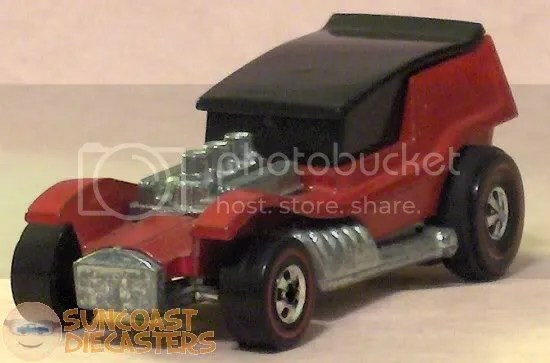 They’re about a third the size of regular Hot Wheels models, which makes them roughly 1/87 scale (and, boy, won’t this look good added to that HO layout you’ve spent 4,000 hours building in your garage!). 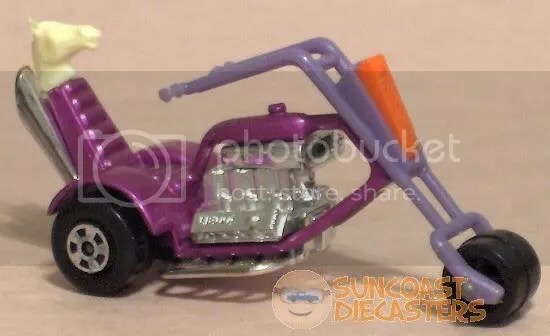 The next several vehicles are from Big Tractor Mike’s bargain bin. 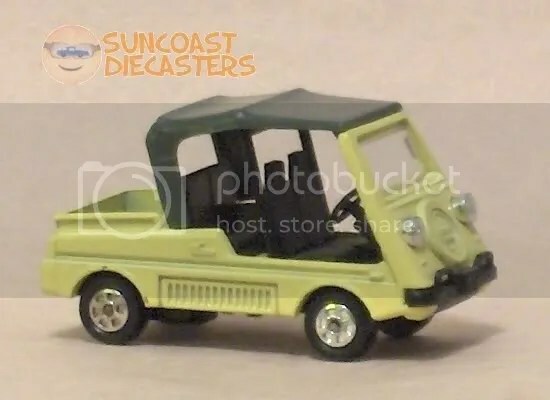 This one, I’m guessing, is a Summer model. 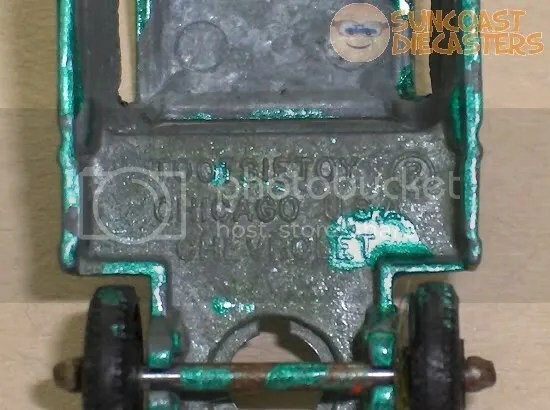 The sub-standard casting and cheap wheels and base are big clues. The trunk seems out of proportion, but perhaps it’s an illusion caused by the sweep of the tailfins. 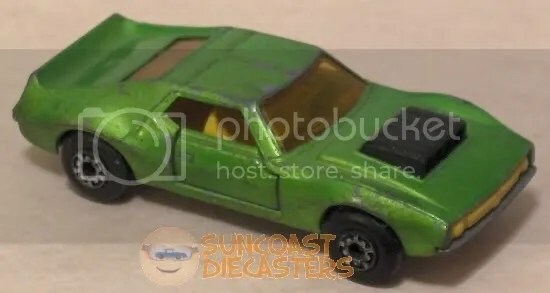 I picked it up because I find it curious, and because it’s another car to add to my “IF I ever start customizing…” pile. 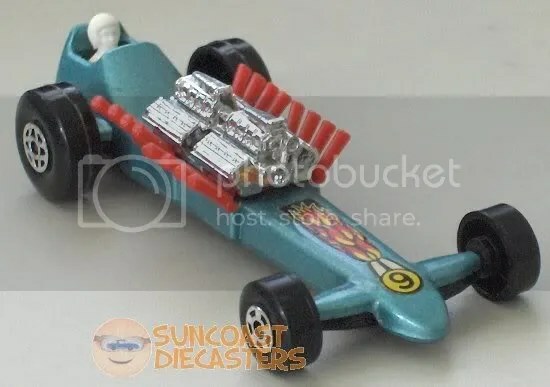 I couldn’t read the fine embossed lettering under the fluorescents at the Sports Bar, but the cartoonish proportions, “space cadet” wheels and pale blue plastic base just screamed, It’s a Maisto! 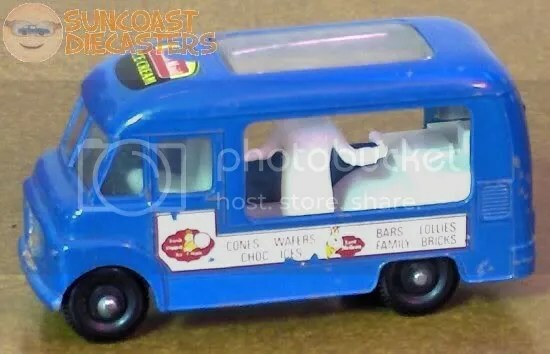 However, the eye loupe at home revealed a huge surprise: (drum roll) It’s a Mattel Meal-mobile! 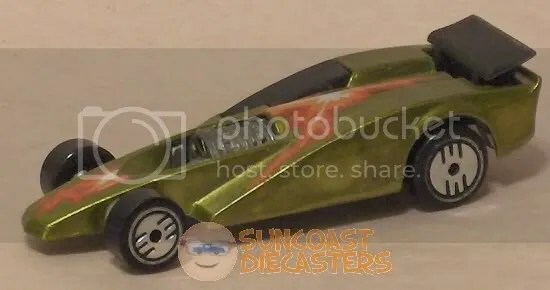 Yep, it’s a Mattel model, Hot Wheels-branded, from a McDonald’s Happy Meal. Which, I must admit, greatly surprised me. 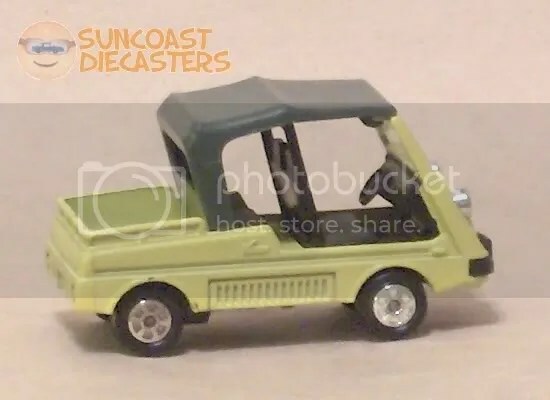 I’ve been collecting McHot Wheels fairly regularly ever since McD offered the Jeep CJ-7 & Tricar X-8 in baggies in the late ’70s; yet, I couldn’t recall this one. 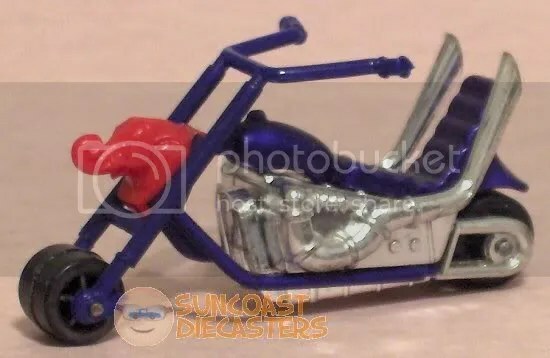 Fortunately, it stated 2001 on the base, so I binged googled various combinations of details, and finally was able to determine that this model is “2K57 Glo-Rider“. Okay, heavy oxidation on the tank; should OHSA or the EPA maybe know about this? 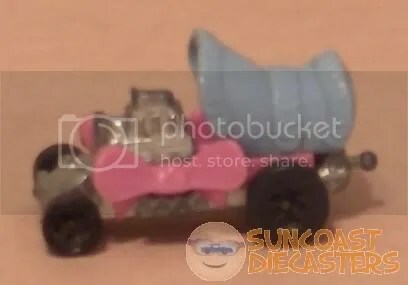 Here’s one that slipped past Quality Control: the left front wheel is, like, totally punched off-center! 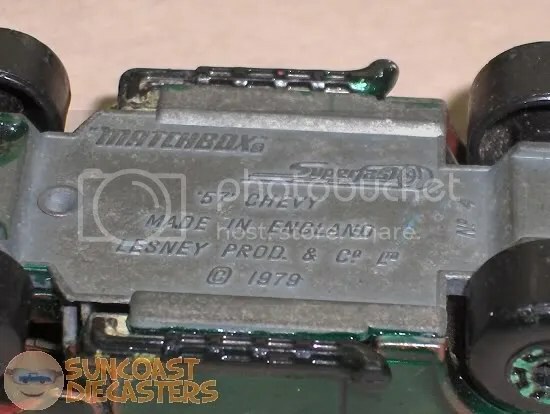 What’s more rare that a British-brand toy car actually made in Britain? 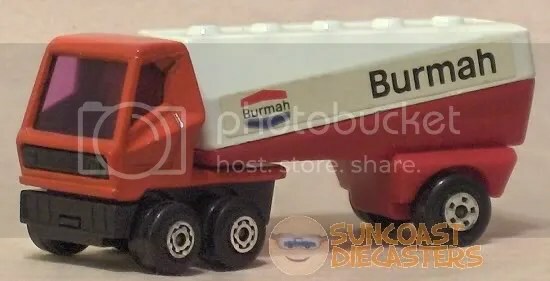 How about an American-brand toy truck actually made in America. 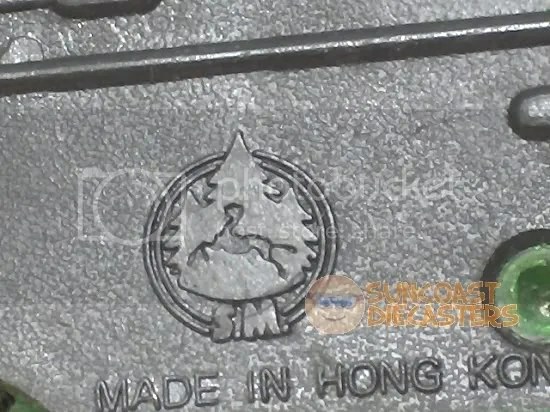 Heck, it even tells us what city it was made in! (Chicago? Sheesh, I hope Rahm Emanuel’s fingerprints aren’t all over this.) 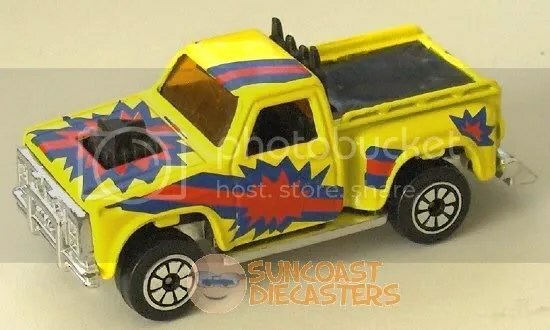 Also, it’s nice to know it’s based on a Chevy design, it’s not a ‘generic’ truck body. Last month, I told you about a RAOK from Kenny; well, I got one from Big Tractor Mike this time! He brought in some great old-school car cases, among which was this l’il retro wonder. Considering both its rarity and great condition, his askin’ price was more than resonable. However, I’m putting funds into a small bidness, so while I could pick up a few cars, the case was out of the question. Time passes… then Mike walks over and hands it to me! He offered it as a thanks for my management of the website! Mike, I seriously do appreciate it. Hey, ya notice that logo down near the bottom? Here’s a close-up. Like me, it may take a moment for you to get it. 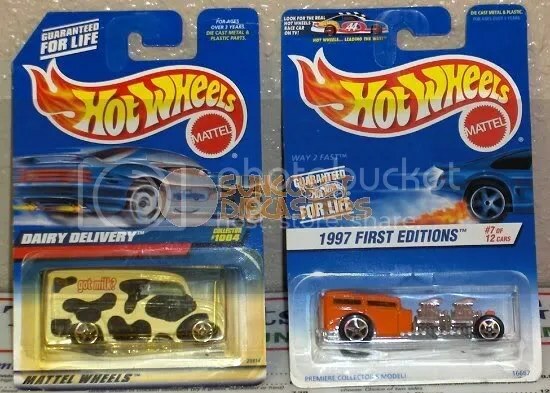 Okay, time’s up: a car case, from Mattel … but it’s not Hot Wheels-branded? Seems a little odd, doesn’t it? Ah, here’s the secret. 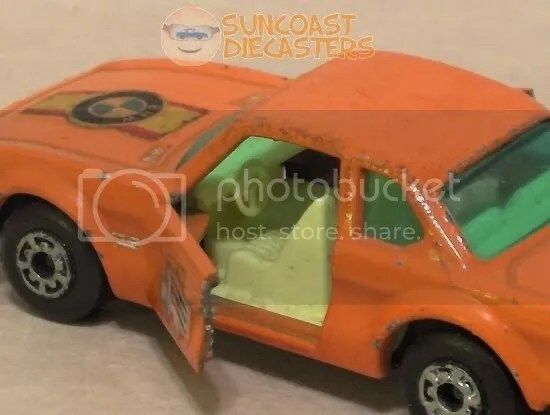 You know those cars in the “Since ’68” packaging? Scope out the year: 1966. Can you dig this? 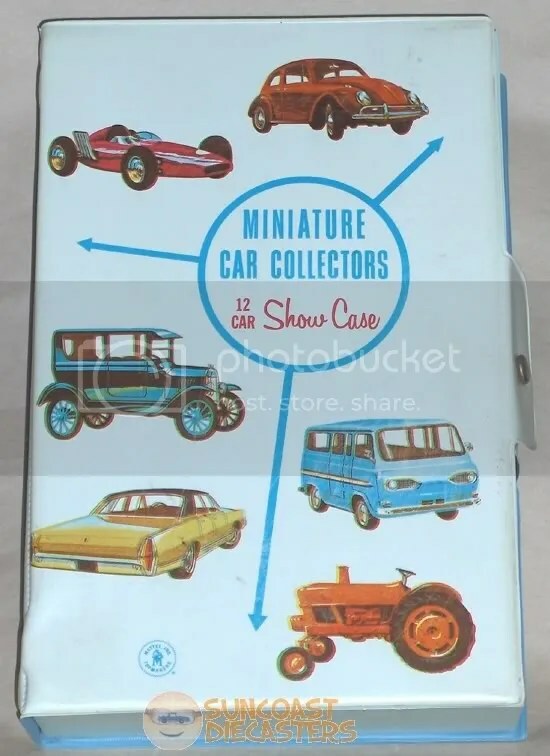 Mattel was selling a car case … before it began selling its own cars! This is exquisite rarity defined. 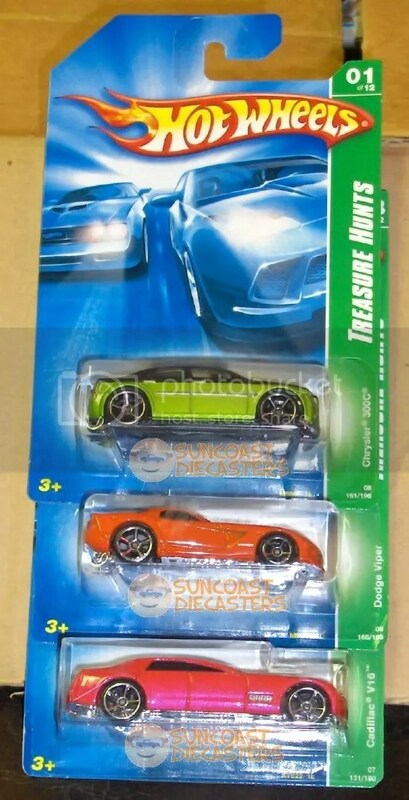 Ken tags a triple-fold triumph for his tally of toy-car treasures with this trio of terrific Treasure Hunts! 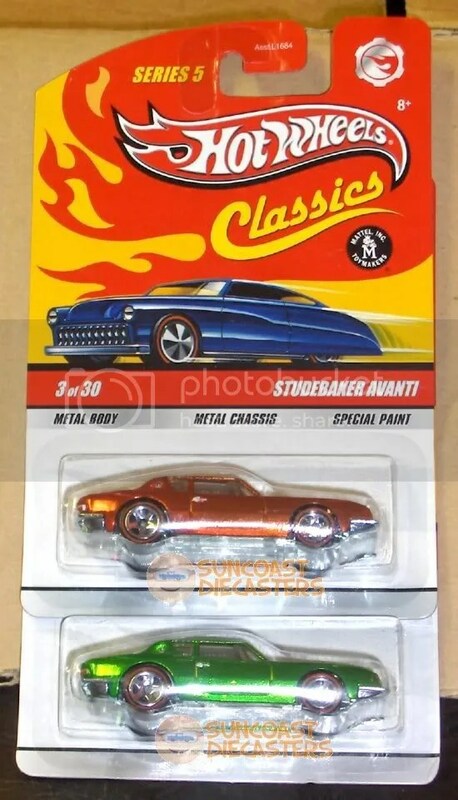 Like Henry Ford said, you can have your Studebaker Avanti in any color, as long as it’s black. In this case, Ken got one in orange black and one in green black. 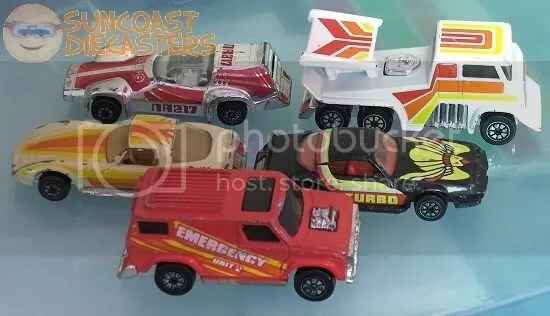 Again, more gorgeous Kenner Fast111’s from Sondra’s collection. Again again, I cannot overstate the rarity of such clear, legible license plates. …And this is The Stingeroo. And here is your showroom shot. 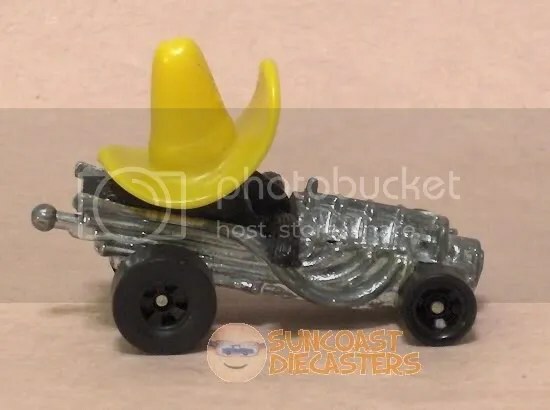 Another incredible Sondra rarity, and my “buy of the month” for April: Hot Wheels’ “Revvers” series Haulin’ Horses. 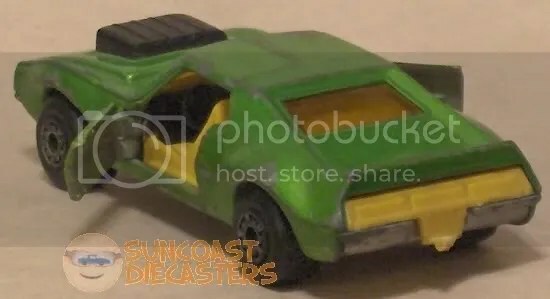 Kinda has a resemblence to Mutt Mobile, don’t it? 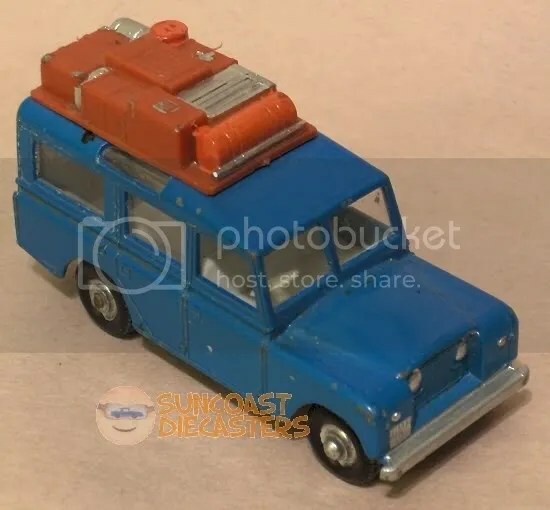 I vaguely remember having one of these as a kid, but I don’t recall which model; probably this one. Hmm? What’s that sticking out the back? Oh, it’s just the knob for the winding mechanism. Yes, winding mechanism! A rubber band would be hooked onto the tongue under the radiator, then onto the hook at the front of the winder. Several smart turns to the winder, and the car would be “revved up” and ready to haul deleted horses across the floor! And in case you’re wondering, yes, I’ve tried it. Used a couple different rubber bands — no go. 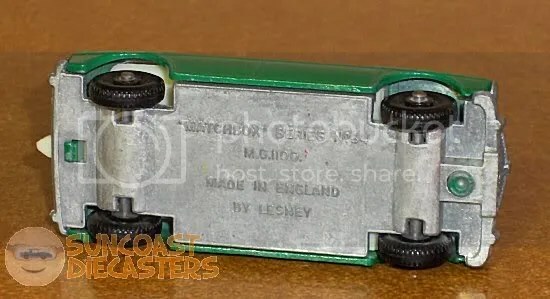 The winding mechanism moves smoothly enough; I suspect that the rubber / vinyl “treads” on the drive wheels have become too tacky with age for it to work well anymore. But, the car’s still beautiful, and I’m still happy! 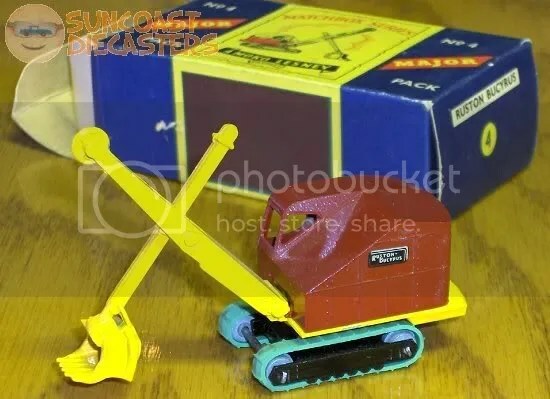 That’s right, it’s the incredibly rare M4 Ruston Bucyrus 22-RB steam shovel, red body, mustard yellow shovel and green tracks, in excellent, excellent, excellent condition (thanks again, Sondra!). 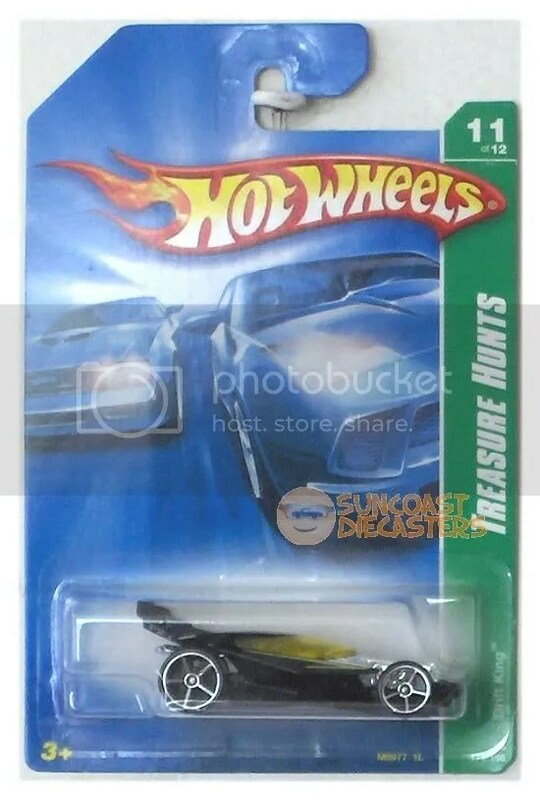 Not only is this model rare, this is the rarest version. When this was first produced, the “22-RB” tampo was done in red — yeah, exactly, a red label on a red body. 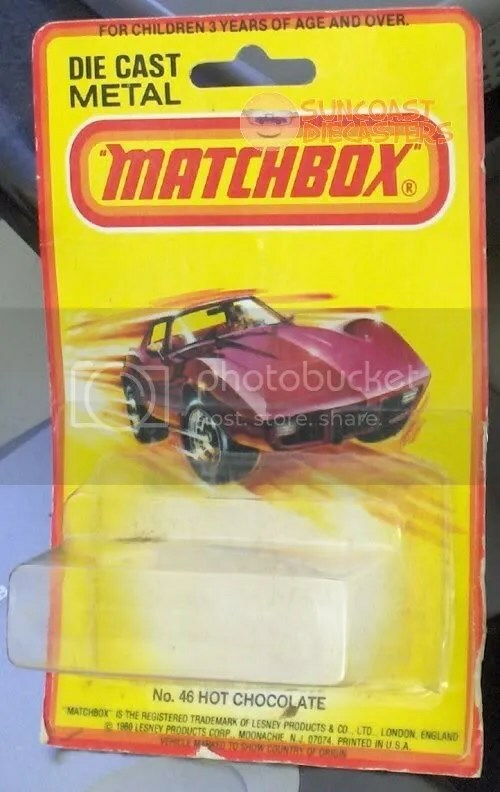 It was near impossible to read, so Matchbox had to quickly redesign it; which means this version almost instantly became a collector’s item. 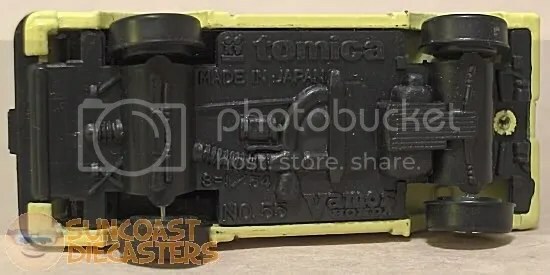 Here is that wonderful, foolish tampo, the mark of a genuinely great find. Congratulations, Mike! We had a serious Redline collector as a guest at our May meeting. His Redlines were in truly superb condition; and of course were accordingly priced. Imagine my surprise when I found these originals in his dollar bin! …SOLD! 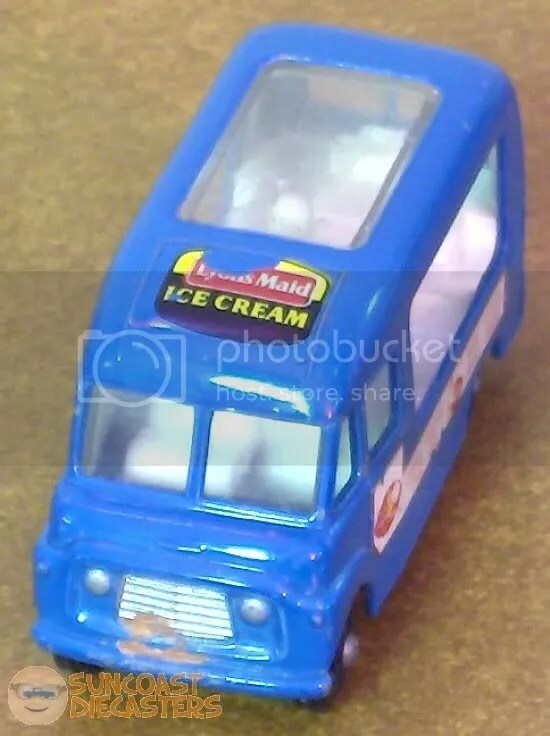 Interesting design idea…but isn’t a sunroof on an ice cream truck just a wee bit counter-productive? If you remember, way back in … (scroll, scroll) … September of ’08, I got an unpunched TootsieToy from BTM. Well, lightning strikes twice! Thanks to Bill (who returned from his mysterious absence), here is an unpunched Ertl — woo-hoo! RAOK: Random Act of Kindness. As we were closing up the May meeting, Ken walks over and hands me this Toyota RAV4, by Edocar. 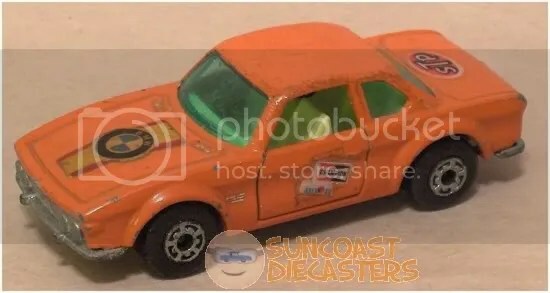 Now, as I’ve mentioned before, great finds at Suncoast Diecasters meetings generally fall into one of three categories: brands I know well; brands I’ve forgotten; and brands I’ve never heard of. This one’s in that third category. 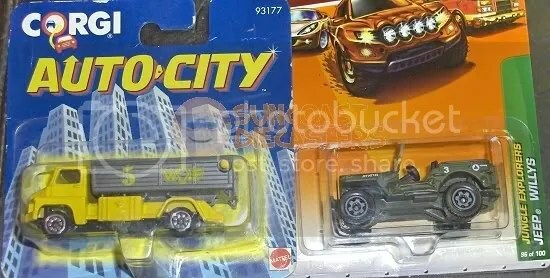 I appreciate it not only because it’s a gift, but particularly because it’s my very first Edocar. Thanks, Ken! 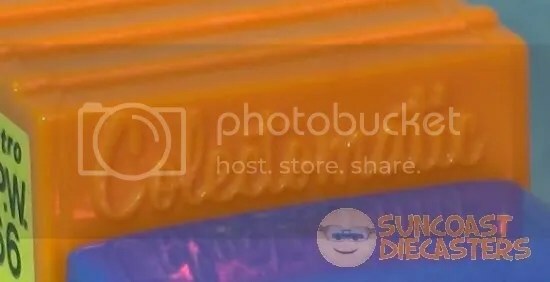 Why did I do a zoom & sharpen on the copyright text? I’ll explain that in a little while. As I was looking over the car before I bought it, I thought it looked good but it seemed odd somehow. 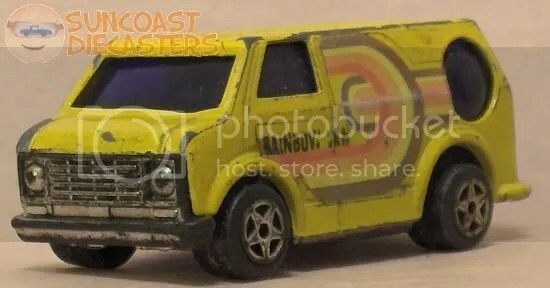 Its proportions seemed a little off, and I spotted what I thougt was a wheelie bar at the back end. 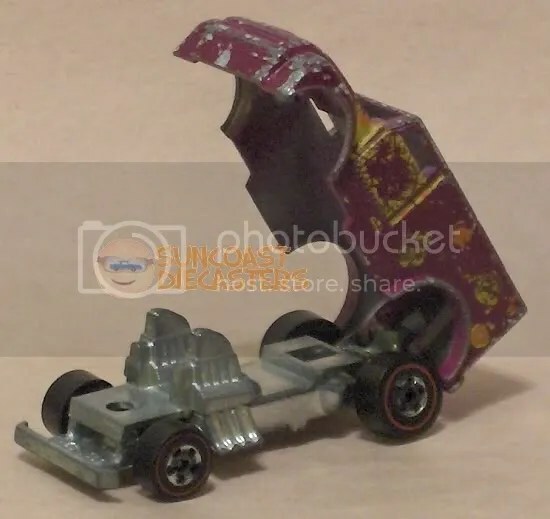 Ken advised me that it’s a hinge, and that it’s actually a funny car, a flip-top dragster. Well, that sealed the deal! 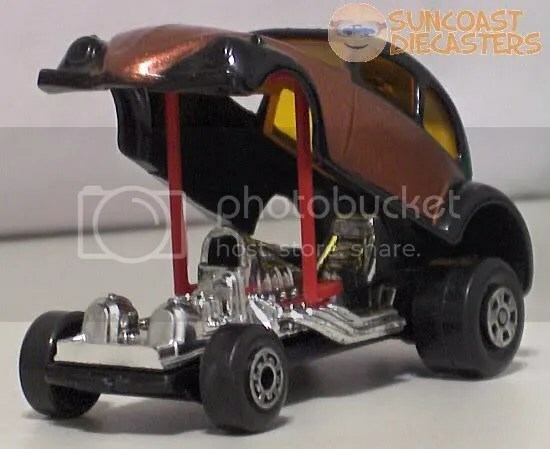 Turns out it’s really a great-looking little dragster. 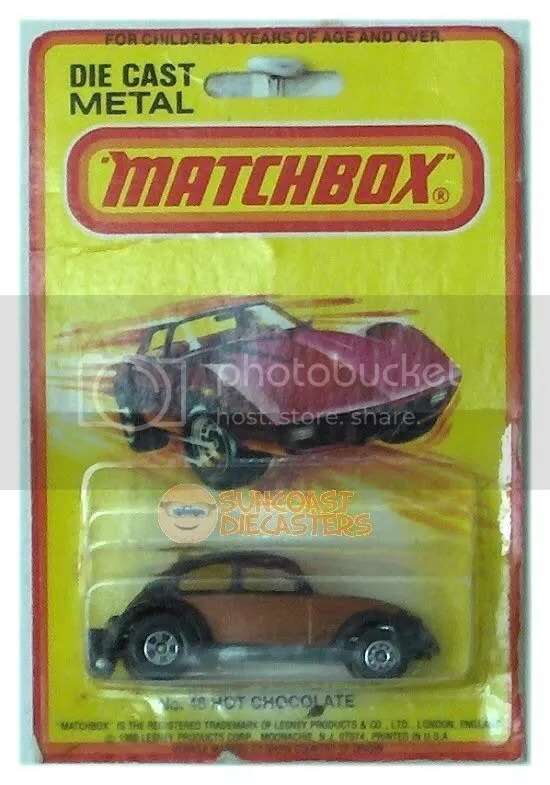 I’m amused by Matchbox’s mid-shell support gimmick, which I guess is their answer to Hot Wheels’ front-end X-fork. …And for those of you who are clutching your chests over me having torn open this classic, relax. Look, the package is completely unharmed, see? 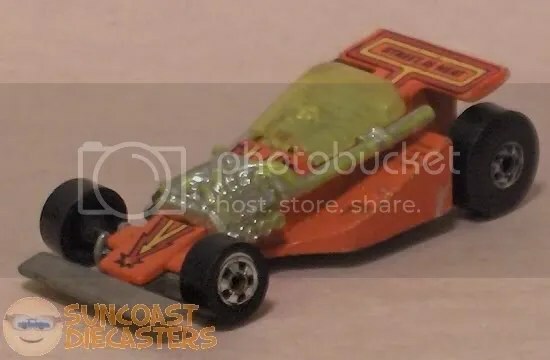 Matchbox Slingshot Dragster, again from Don’s collection. Man, this thing is pristine. The sticker is in great shape, and dig it: all sixteen pipes, whole and awesome. Here’s why I did the copyright thing earlier: 1971, made in England. 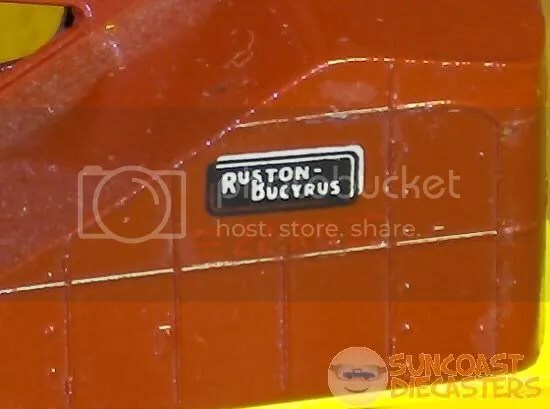 The 1980 copyright says Vehicle marked to show country of origin. A bit of a change in nine years, eh? 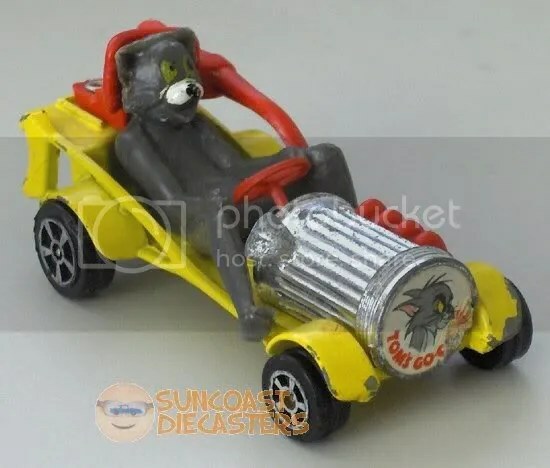 Corgi Tom & Jerry Tom’s Go-Cart, from Don again. 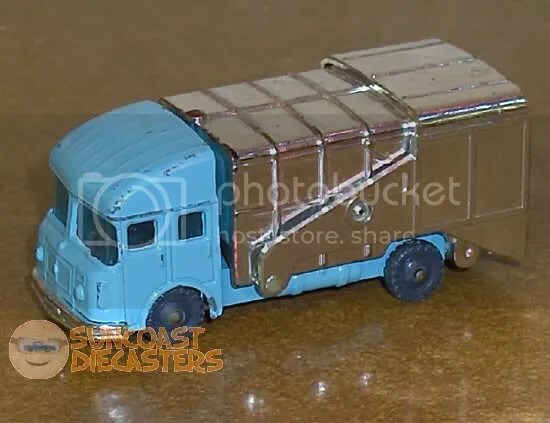 This is one of those rareties I never expect to see except on some other collector’s website. Oh, it’s just the studio, keeping its fingerprints on things. Maisto HoopDe Coupe, from Ken. Maisto’s original designs seem to fall into two categories: reasonably cool, and completely ridiculous. This one is reasonably cool. 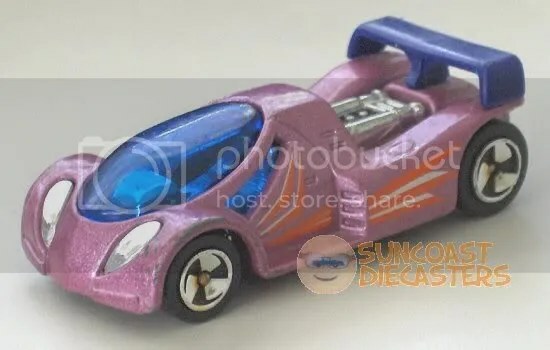 Has kind of a Deora/Nightburner vibe to it. 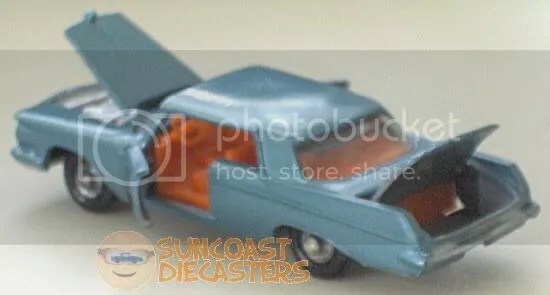 The candy color scheme and thick spoiler make it look more like a toy car than a miniature car, but it’s still a good design (and I hadn’t seen it in the stores, so, thanks, Ken!). Ah, now we get to Sondra’s collection. 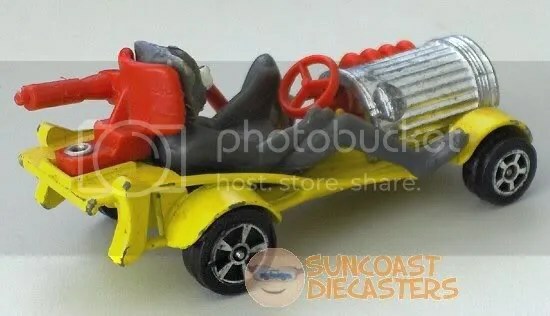 These are Kidco Burnin’ Key Cars race trucks; they (originally) included a key which would launch the toy via the internal spring mechanism. 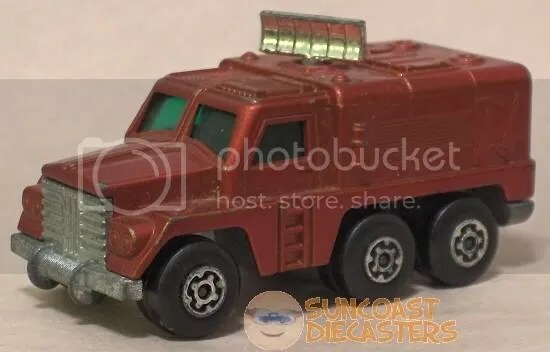 The unfortunately flattened tires negate the value for hard-core collectors, but I have only one other Kidco that I know of, and it’s not a BKC, so with these I upped my Kidco collection by a whoppin’ 200% in fell swoop. …But it’s very rare to find one with such an exceptionally legible license plate! 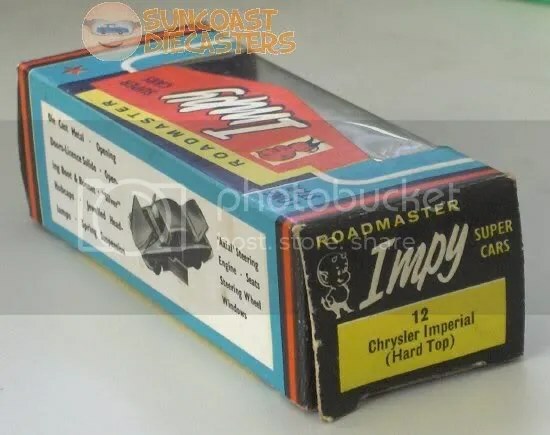 Here we have my personal “Buy of the Month” from the March meeting: Chrysler Imperial hard-top, by Impy (again, from Sondra’s collection). 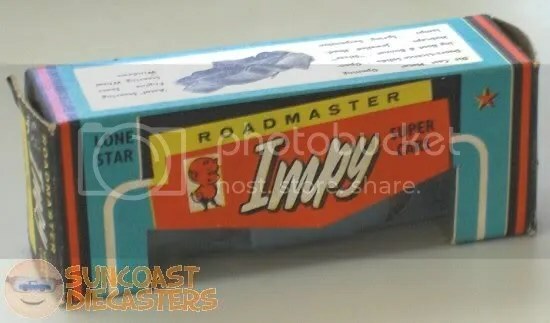 This is — as I have mentioned before — one of the best things about being a member of Suncoast Diecasters: not just having the opportunity to aquire classic Hot Wheels and Matchbox models, but to revisit older classic names such as Corgi and Tootsietoy, and to learn about names previously unknown to me, such as Yatming and Impy. 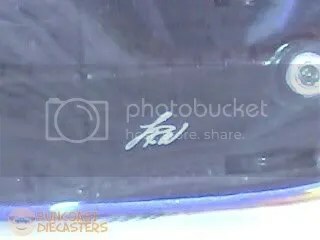 These next two pictures have not been “photoshopped”; nor has the car been customized or modified. 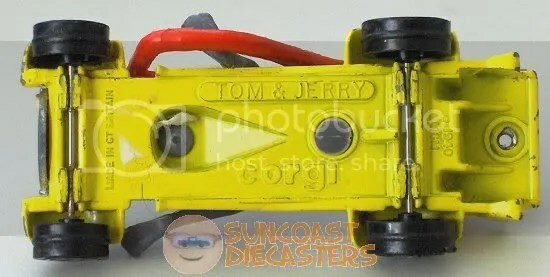 This is the original toy, with original working features. Hey, Greenlight, ya got anything like this? What? No? Yeah, I didn’t think so! 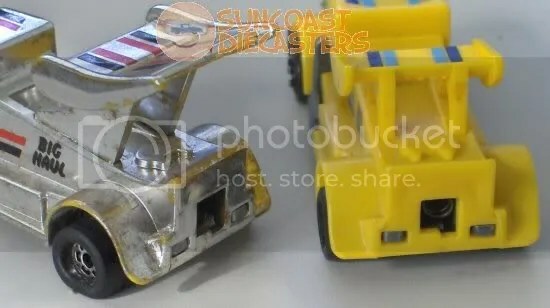 Another quality feature not seen on today’s toy cars: jewelled headlights. These are jewel-faceted translucent inserts. 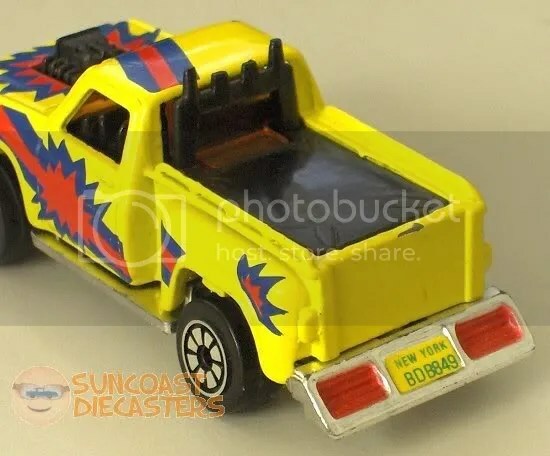 And you thought finding a modern Matchbox or Hot Wheels with painted or tampo taillights was “da bomb”. 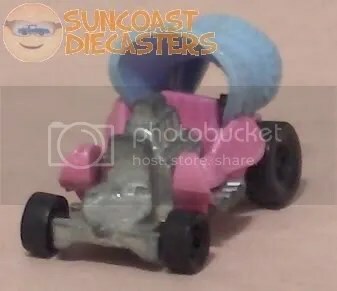 One more groovy detail: In case you hadn’t noticed, the front wheels are in different positions in each of the above shots. Here’s the secret: axial steering. 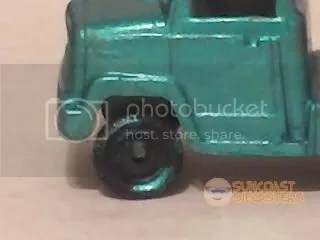 The front wheels can actually be positioned back and forth. 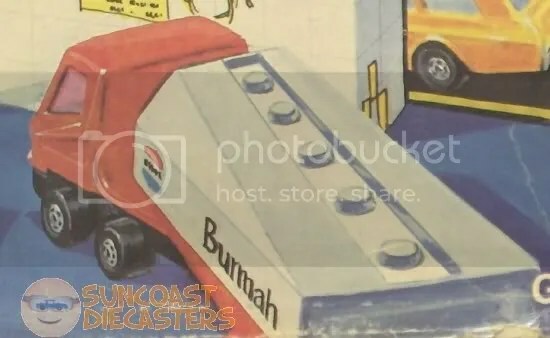 When did you ever see that on a blister-scale car? 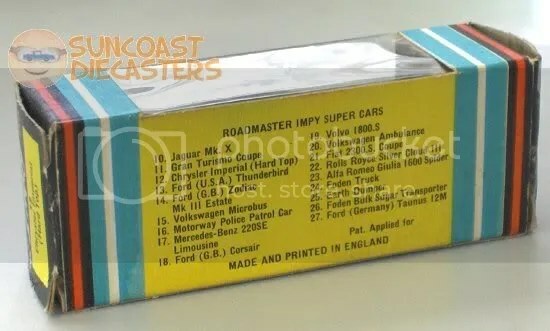 And finally, here’s a little something for you young whipper-snappers who are accustomed only to the generic cardboard-&-blister of Matchbox and Hot Wheels, and the hermetically-sealed clamshells of Johnny Lightning and M2 Machines: Dig these photos of the classy way toy cars used to be packaged. 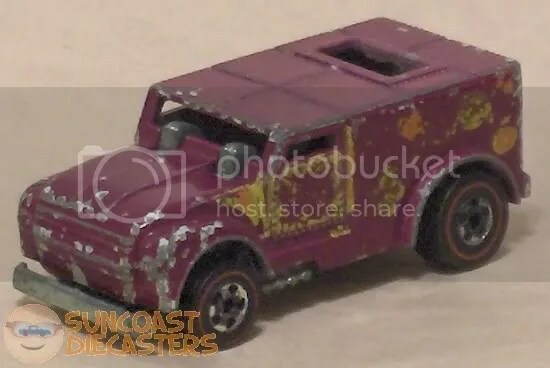 Here’s a second shout-out to Big Tractor Mike: Road Mates-branded Playart diecast. 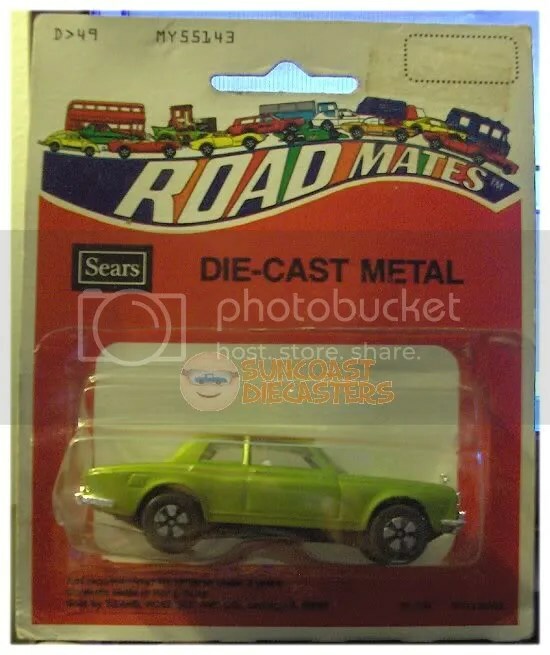 Man, I remember when Sears had a Toy Department — I mean an actual department — but I do not recall seeing these. This is Playart’s beautiful rendition of the Rolls Royce Silver Shadow. While I couldn’t get a better macro shot of it, if you look closely at this pic, you’ll see there’s a tiny little Spirit of Ecstasy on the hood, er, bonnet. 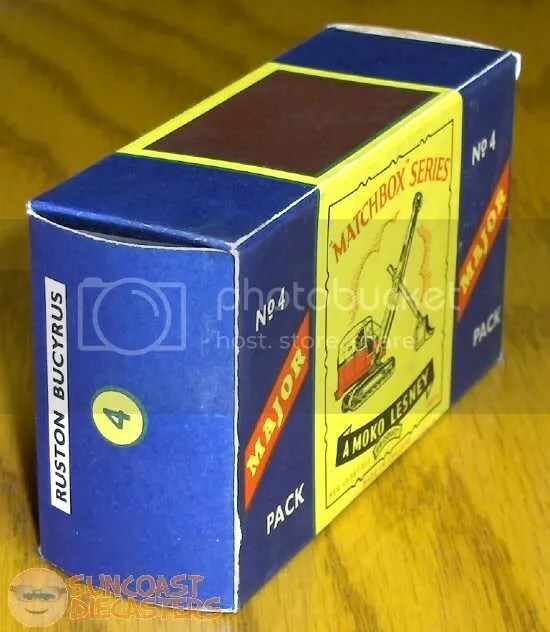 And the fact that the model is still in its original package just makes it that much more beautiful. 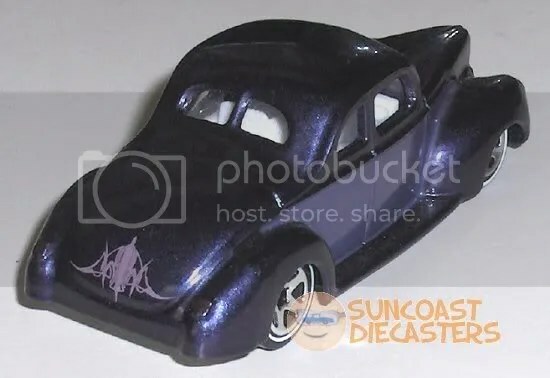 See, folks, it’s just this kind of gorgeous rarity (plus that fact that BTM has a couple left) that makes it important for you to stop by a Suncoast Diecasters meeting. 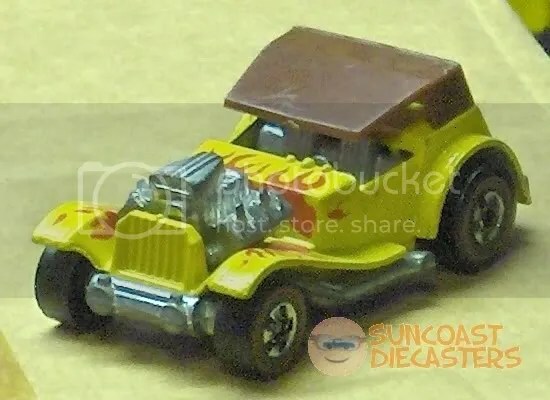 Matchbox has a version… Johnny Lightning has a version… So it’s no surprise (and a nice treat) that Hot Wheels would eventually offer a version of the Thing. Of course, HW had to different, naming its version Type 181. Oh, in case you’re wondering, yes, it’s in front of my computer. Why? 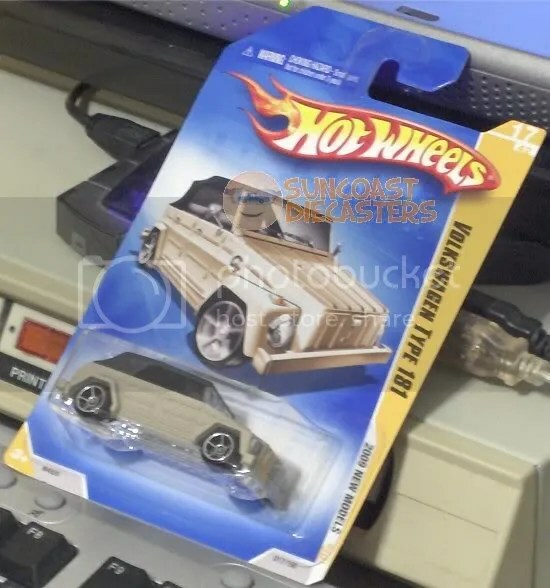 Well, I had seen these previewed online, but I didn’t think they were out on store pegs already; so, when Rob showed up with a stack of ’em, I was so surprised at being able to get one so readily that I completely spaced on shooting ’em at the meeting. Jim brought many great classics and rarities to the Feb meeting. 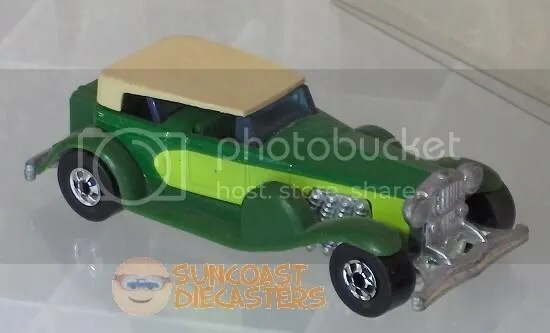 Example: here’s an original Greased Gremlin, in really nice condition, posed next to a stylish new Classics version (courtesy of a local Publix). This sad little fellow turned out to be more interesting than its “missing several pieces” condition would indicate. 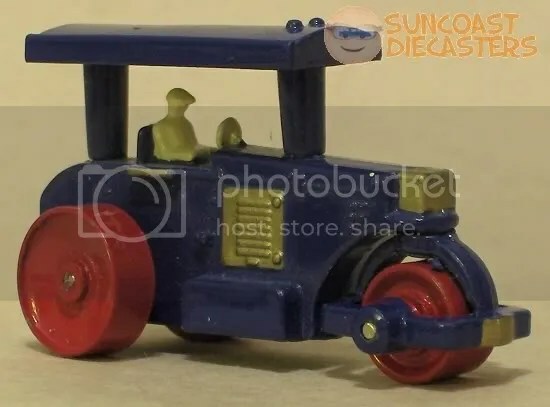 I originally bought this from Big Tractor Mike with the intention of maybe customizing it. 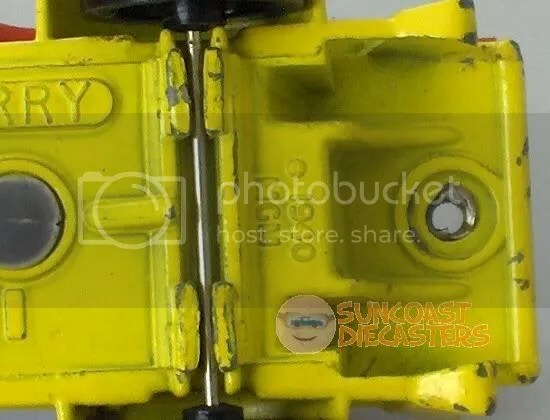 The only data on the bottom were “Made in China” and the number S8512. 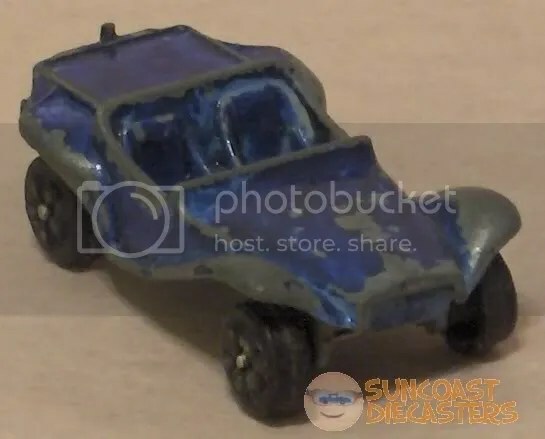 I googled the number, and got tons of useless hits; re-googling with toy brought up this Breithaupts page, which says the car was made by Summer, and is a Krieger. I couldn’t find much info online about Krieger, but I did learn that Krieger made some of the earliest electric and electric-gasoline automobiles. That’s right, kids; Krieger made hybrids decades before the word hybrid became fashionable. So, I’m gonna keep l’il lonesome here just as it is. 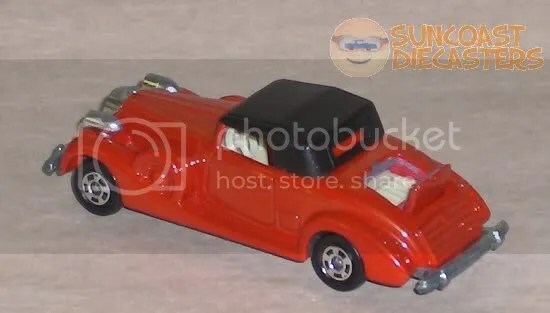 Tomica Packard coupe roadster, courtesy Big Tractor Mike. 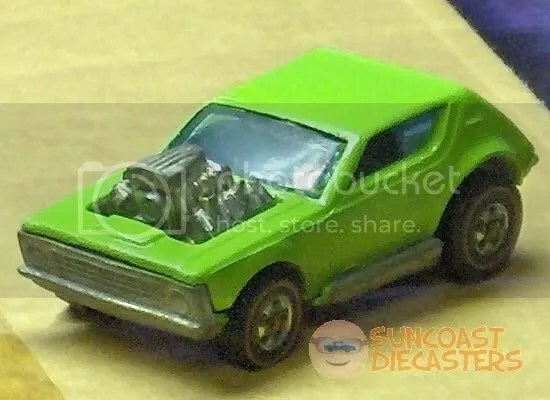 I had the crazy notion of cutting out and hinging the hood, and throwing in a hot rod-style engine, with a view to making it into an ersatz Classic Cord. However, I’ve come to realize it’s too nice to mess up. First, it has some heft for its slim design, meaning there’s some good metal here. 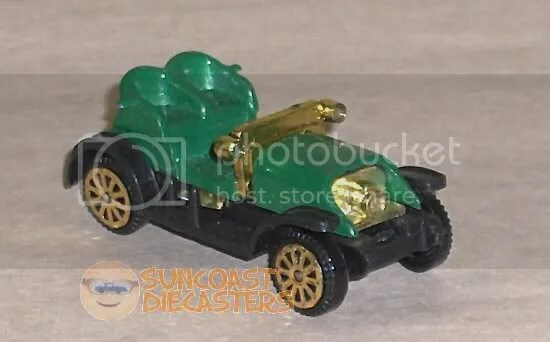 It’s a nice casting; it’s in great shape, with only age-discoloration on the chassis. The tires have a “Whizz Wheels”-style ridge. And how’s this for quality design? : the drop-top, which on most most models simply snaps in place (and so can be easily lost), is actually soft-riveted onto a tab that extends back from the top of the window frame! 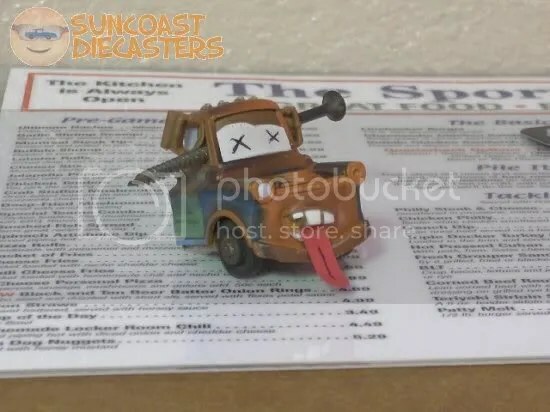 Um… Now, Jimmy, what’s the mater with this here picture here? We enter into to 2009 with some great additions: Customs Galleries. Here’s a sneak peek at Rob’s gallery; please be sure to check out Jeremy’s gallery as well. –There’s an actual driver in the vehicle! I know, I know, some of you youngsters are saying,”So? 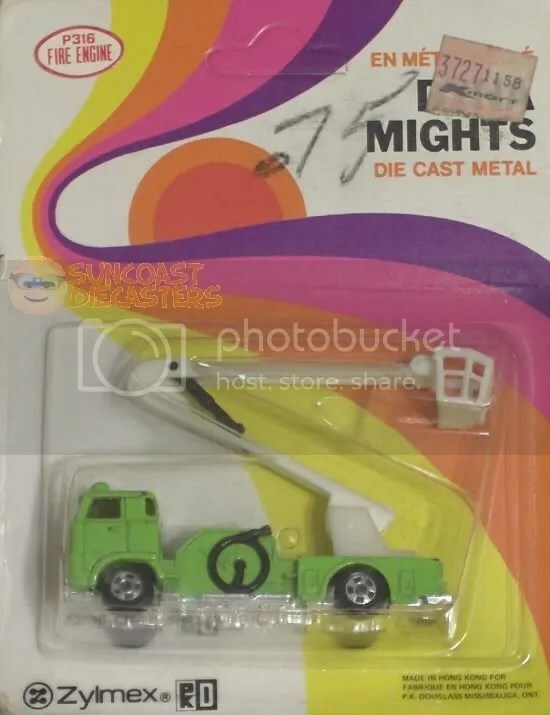 Driver — big deal!” I can’t explain to you how cool it is to us old-schoolers to have a model with an actual driver figure. Ken started the year with some nice bling when he picked up this chromed-out Husky garbage truck. 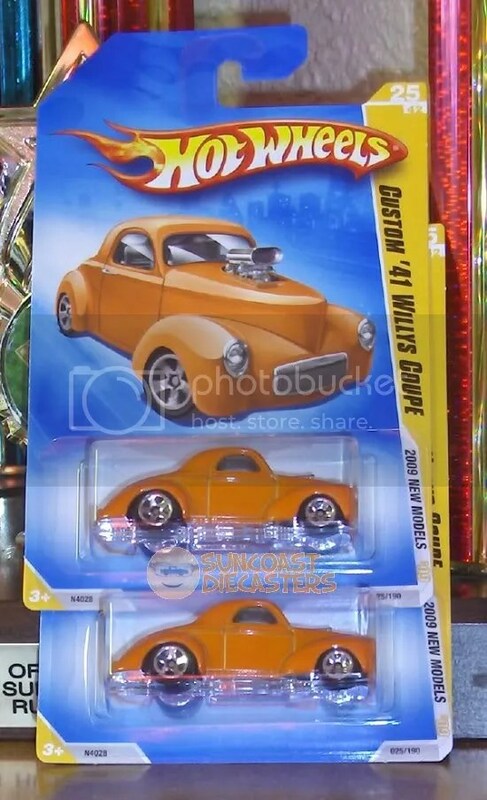 Ken then scored nicely when he doubled up on these gorgeous orange Willys coupes. 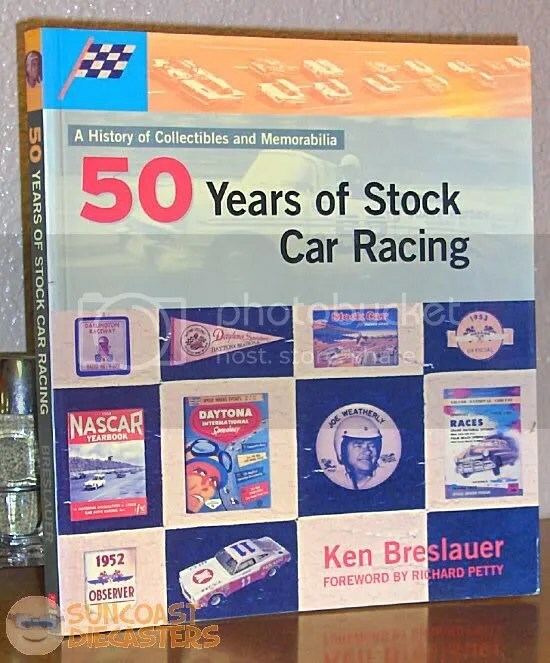 Tom scored the “Buy of the Month” when Mike C. sold him this wonderful book, 50 Years of Stock Car Racing. This book is fully loaded with beautiful photographs, poster images and other illustrations. A great way to start the year, Tom; congratulations!